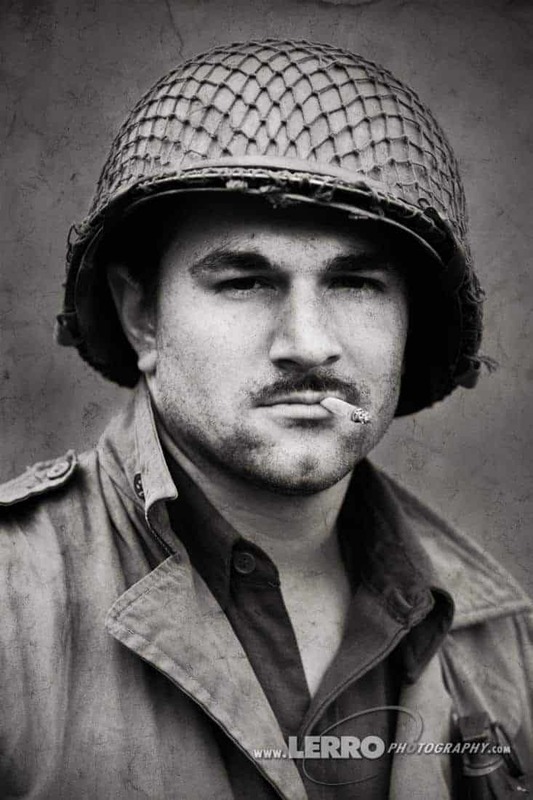 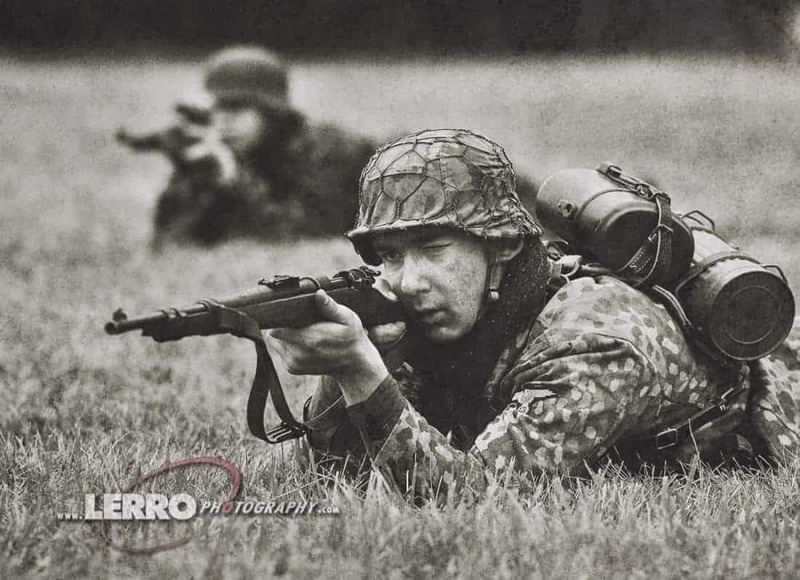 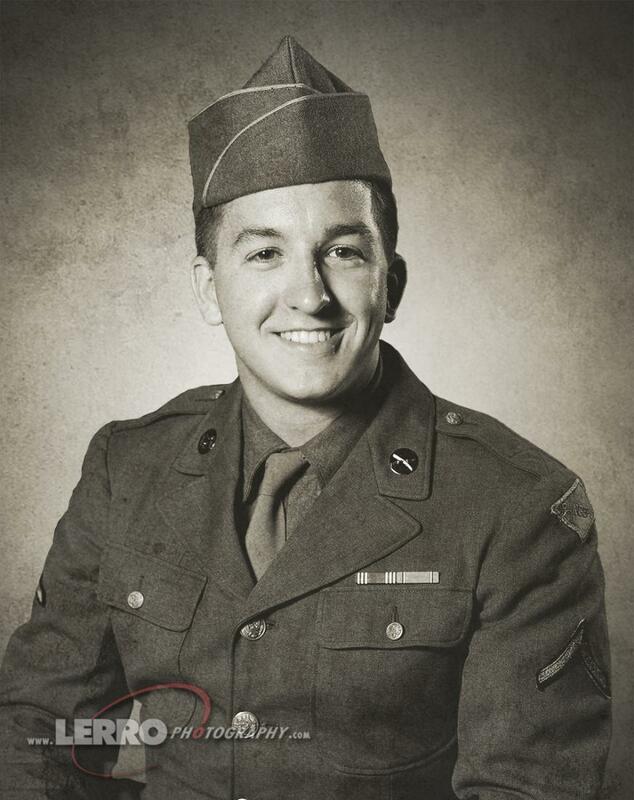 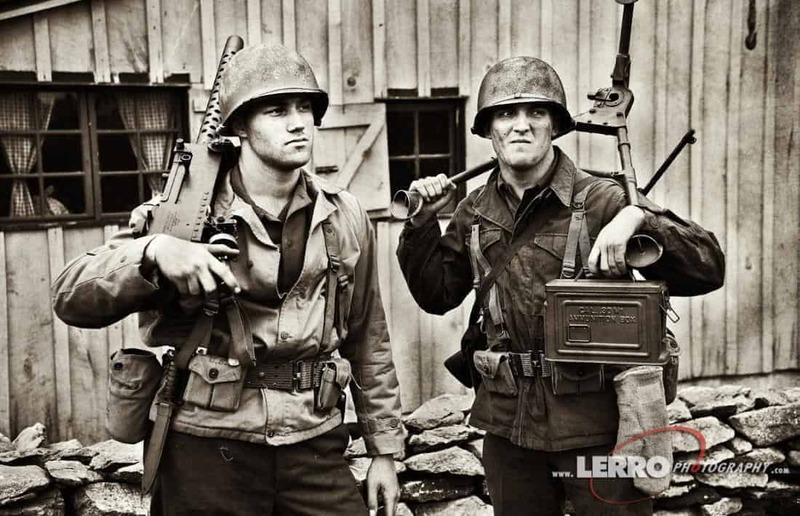 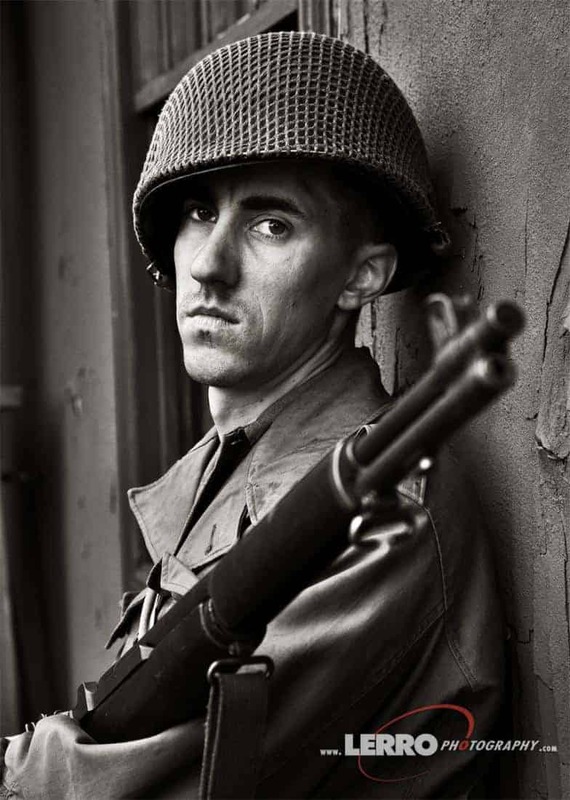 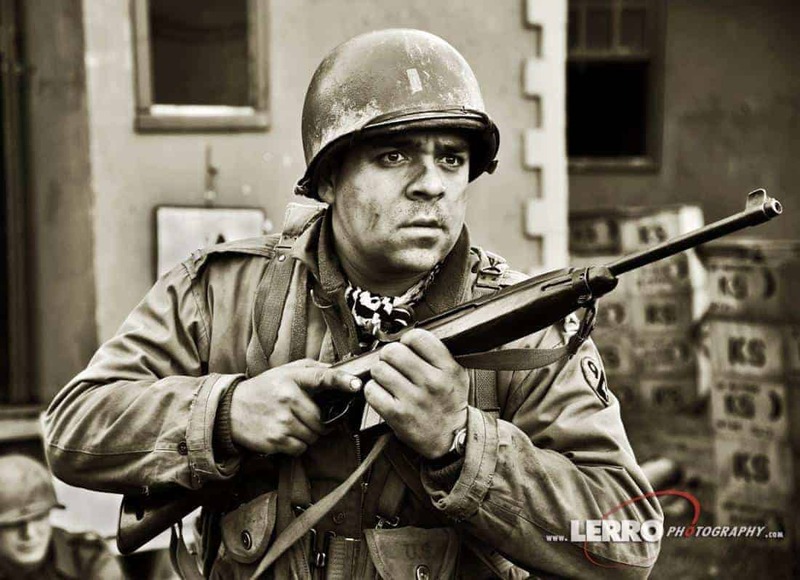 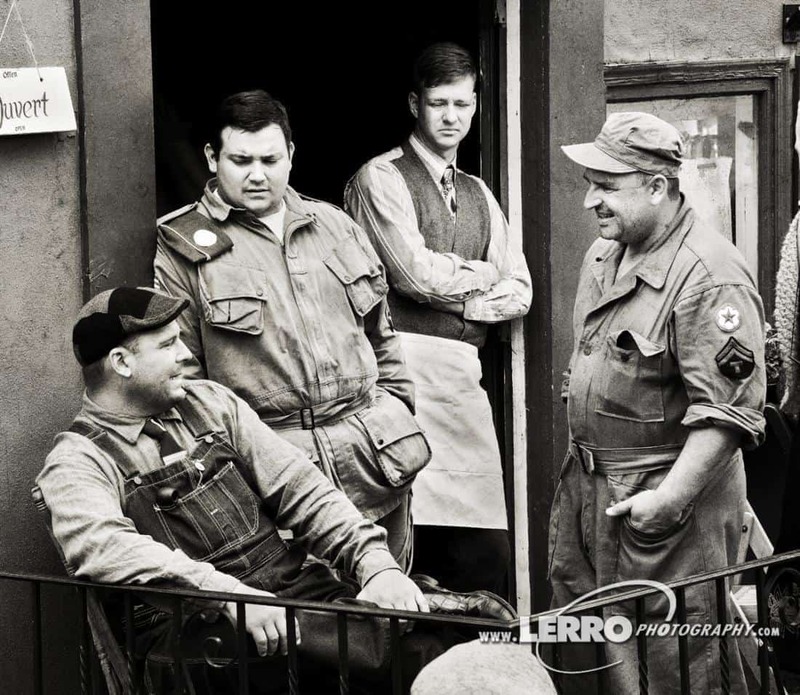 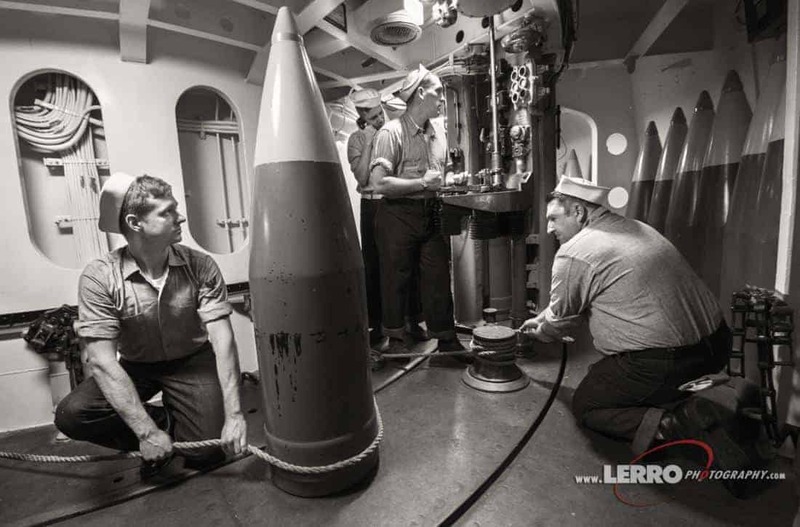 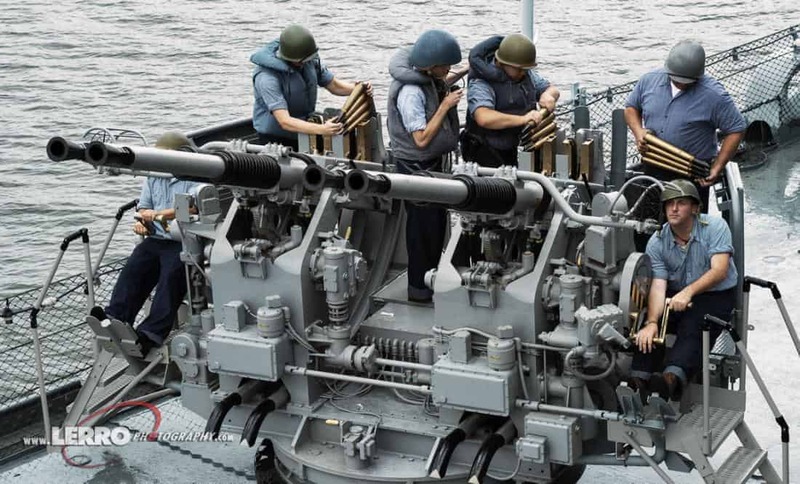 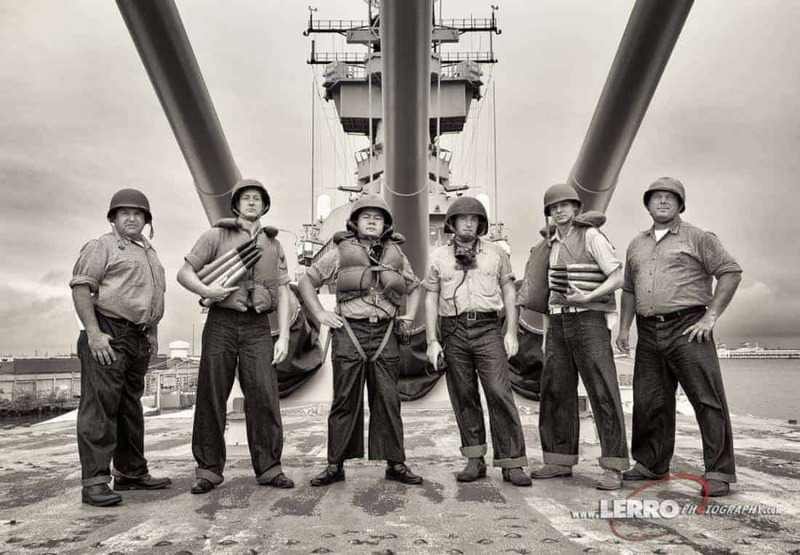 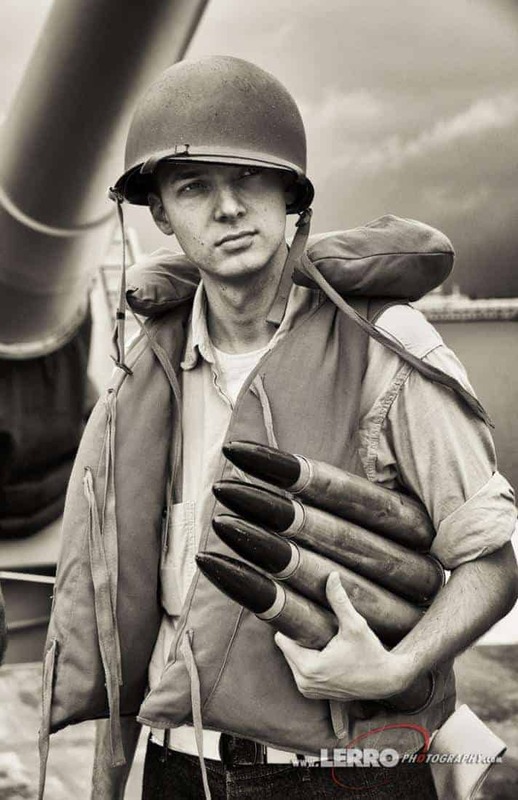 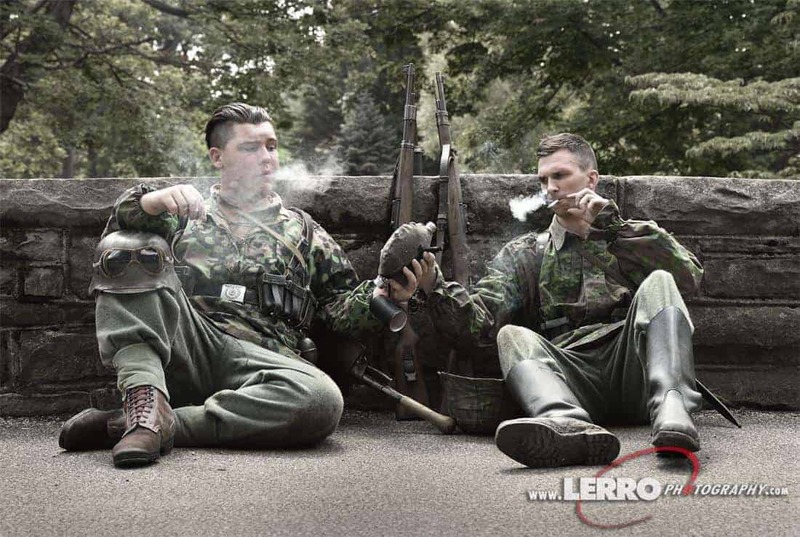 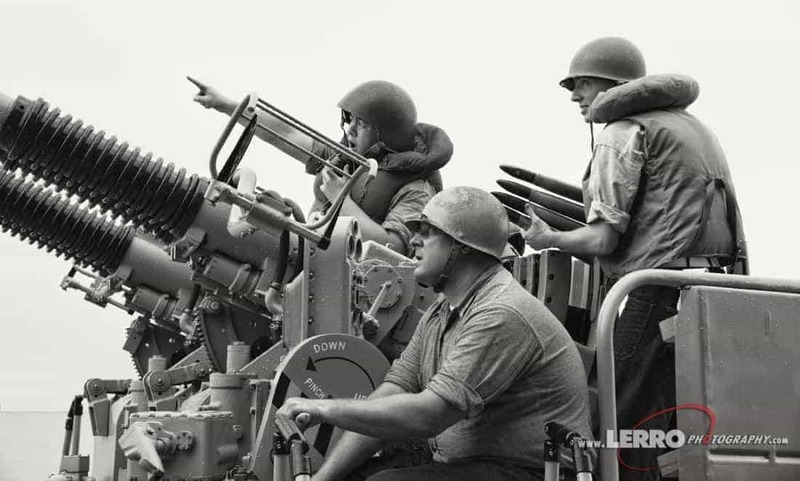 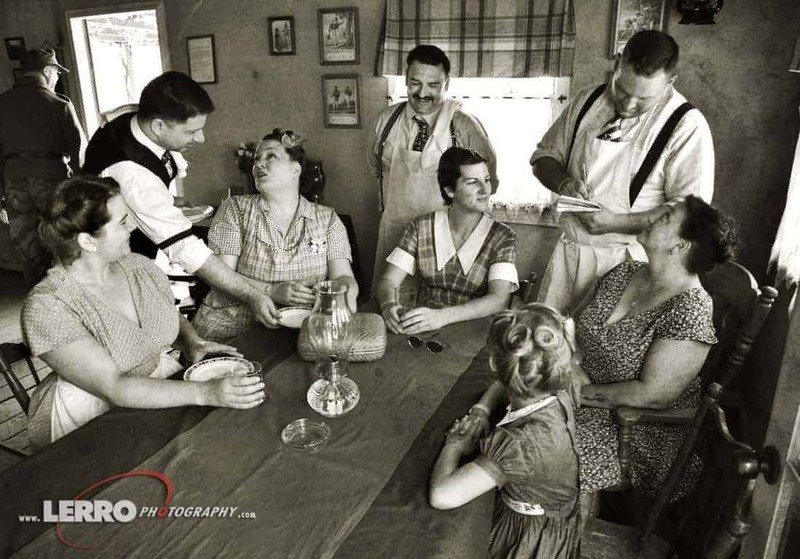 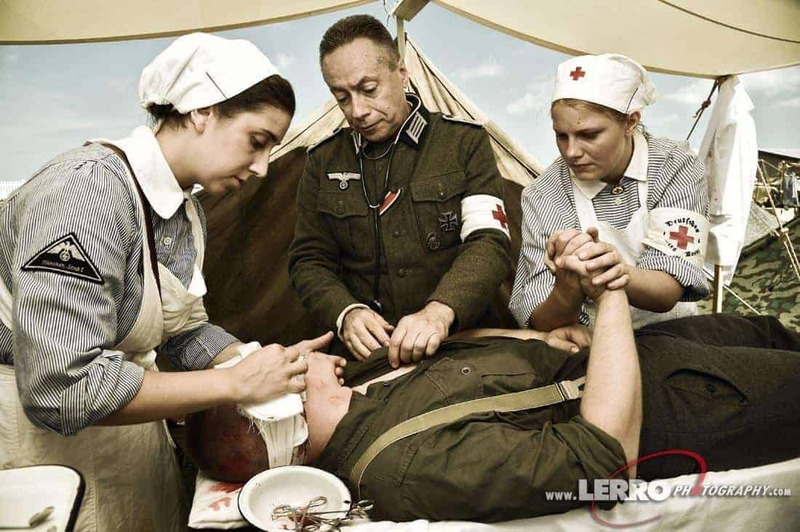 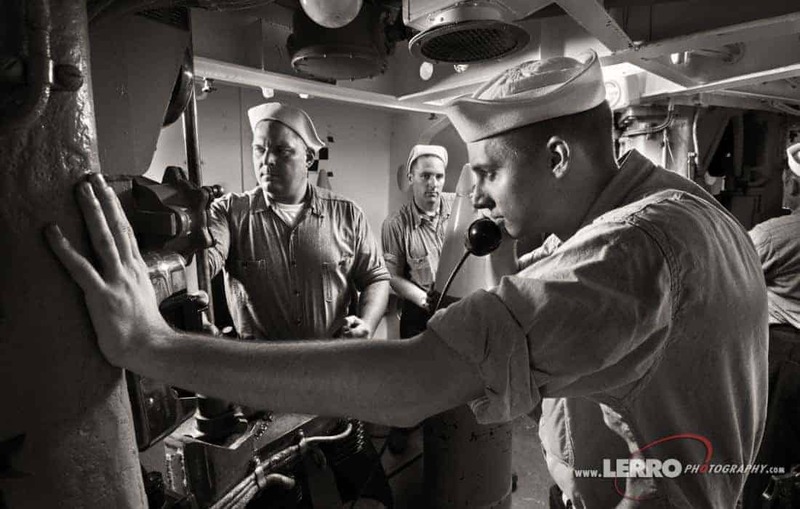 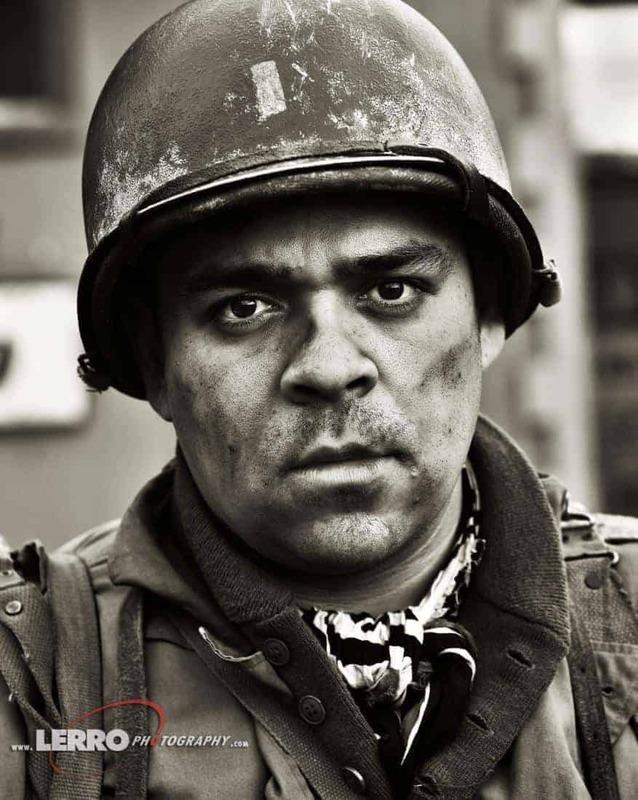 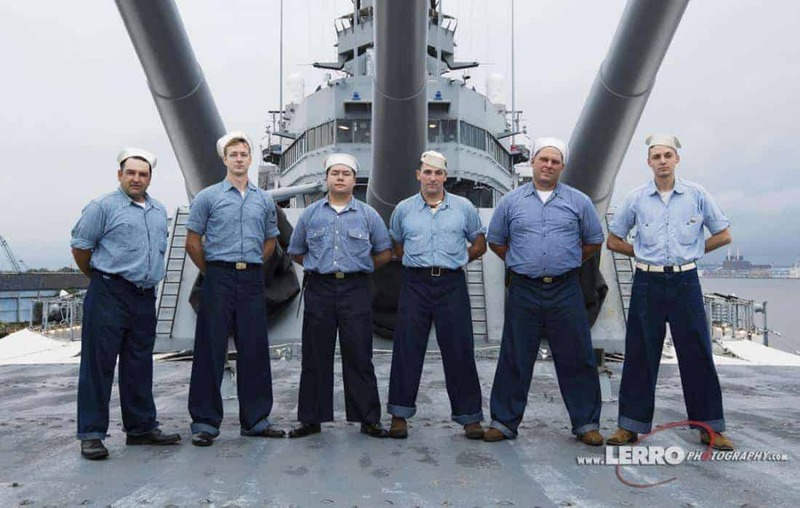 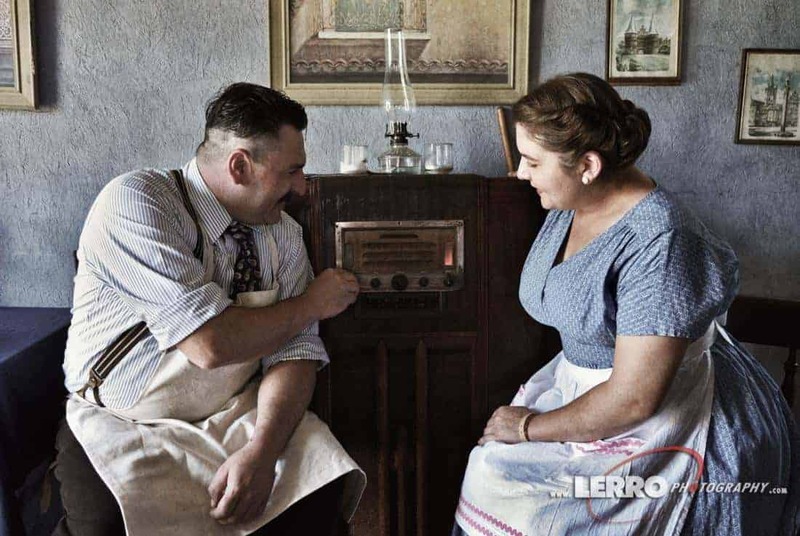 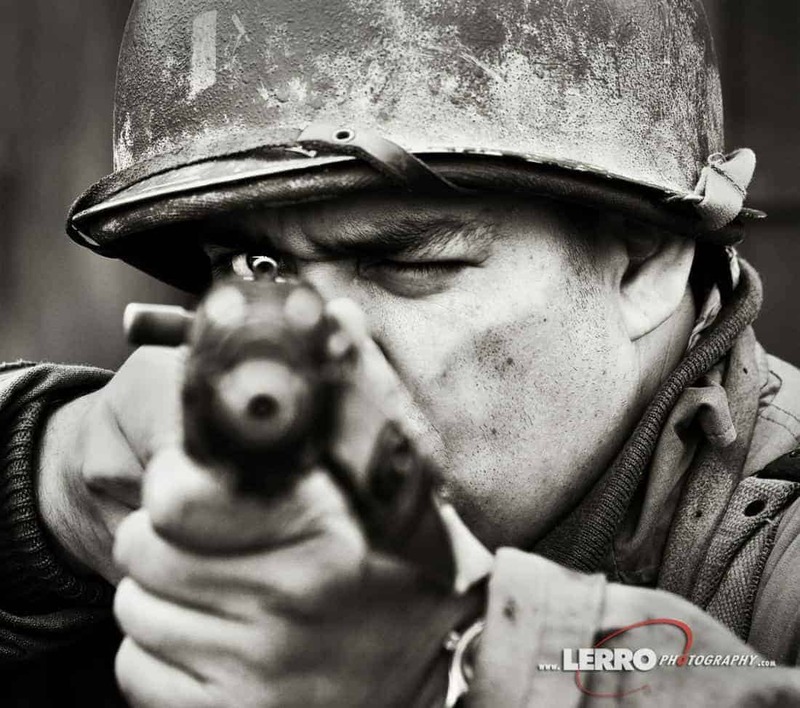 When attending our historic reenactment photo shoots, we always take an immense amount of pride to ensure the historical accuracy of every possible detail; from props, clothing, hair styles and scenery. 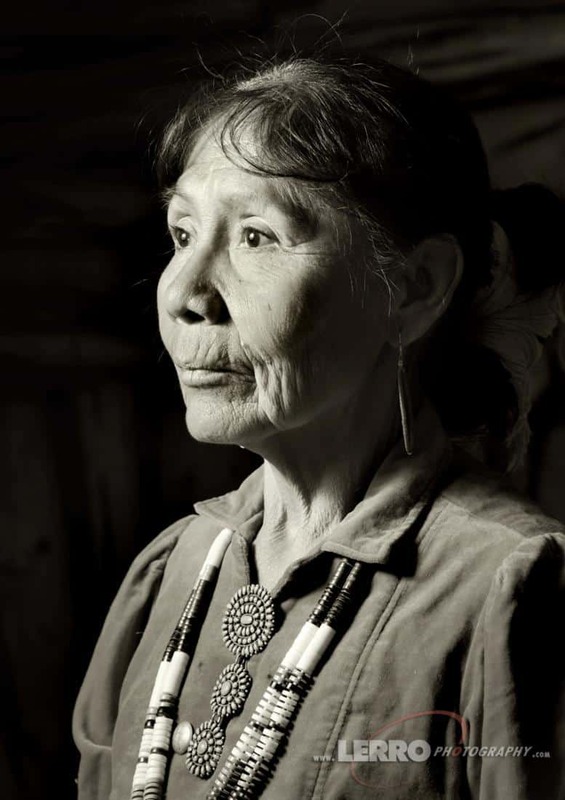 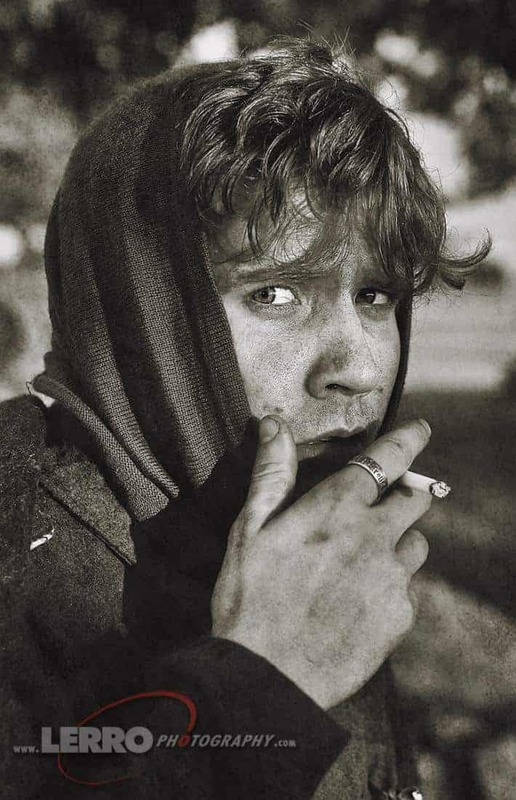 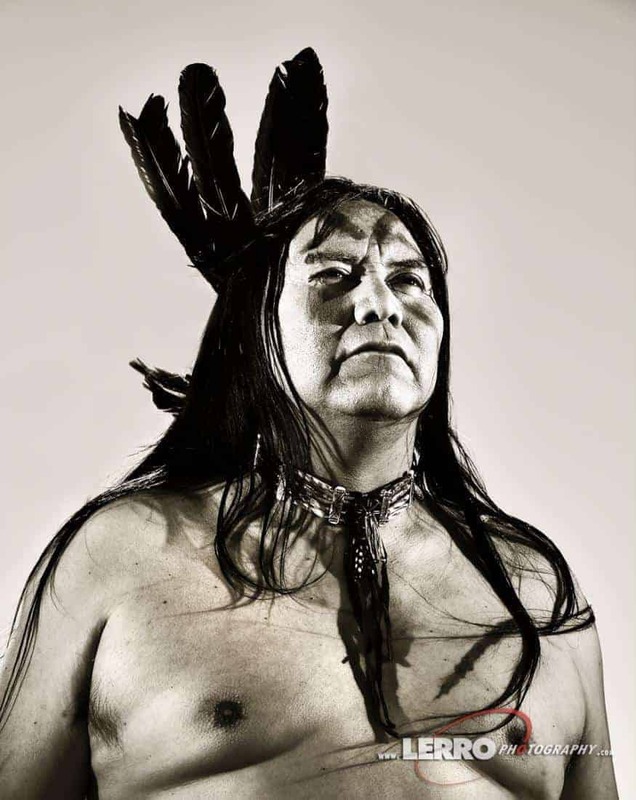 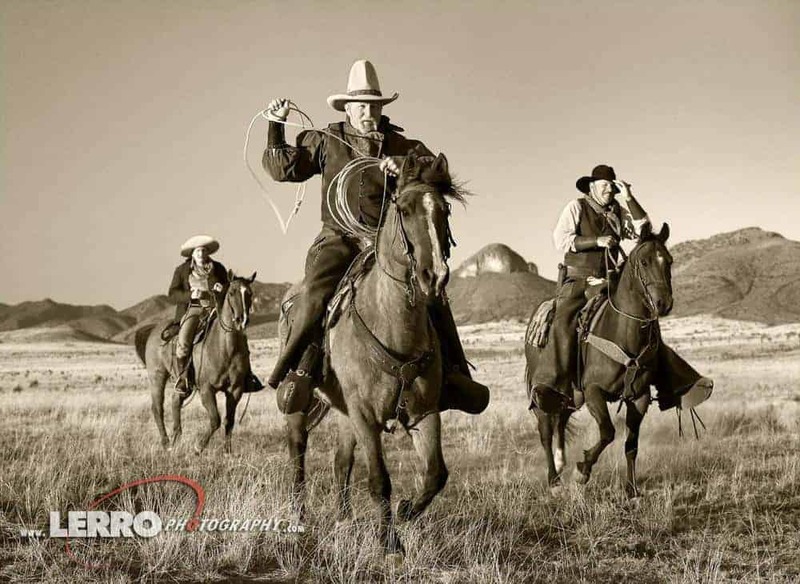 During our past shoots, we’ve photographed cowboys of the southwest, the Native American Navajo Nation, Rosie the Riveter working in the factory, WWII battle scenes and WWII bombers on the ground even an air to air shoots. 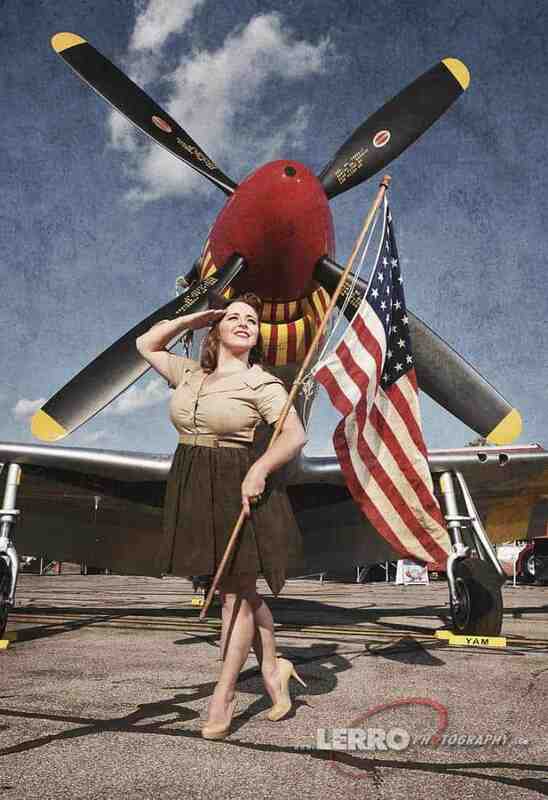 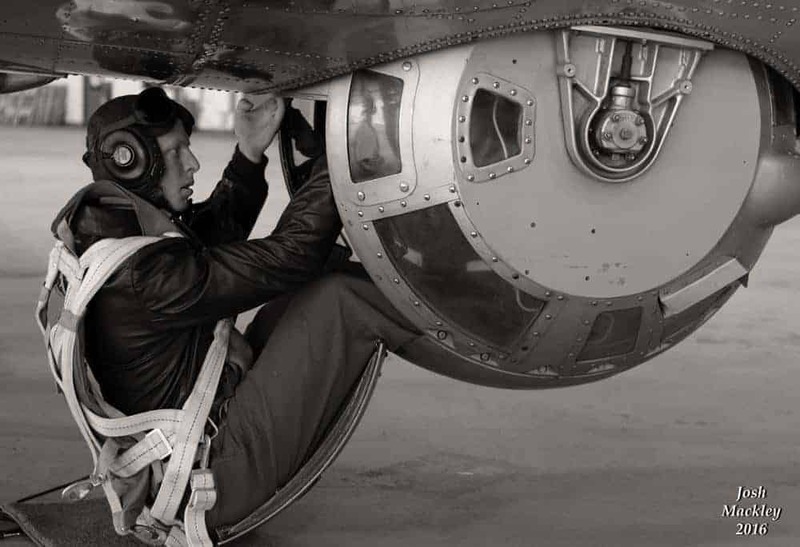 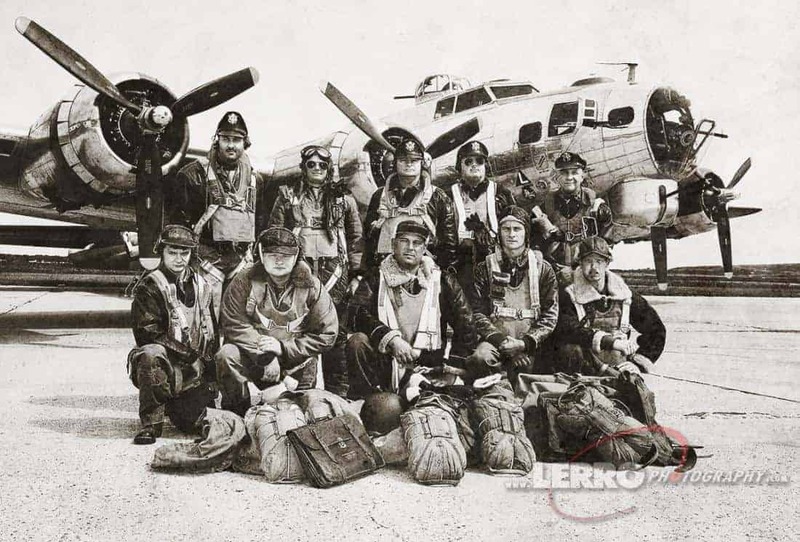 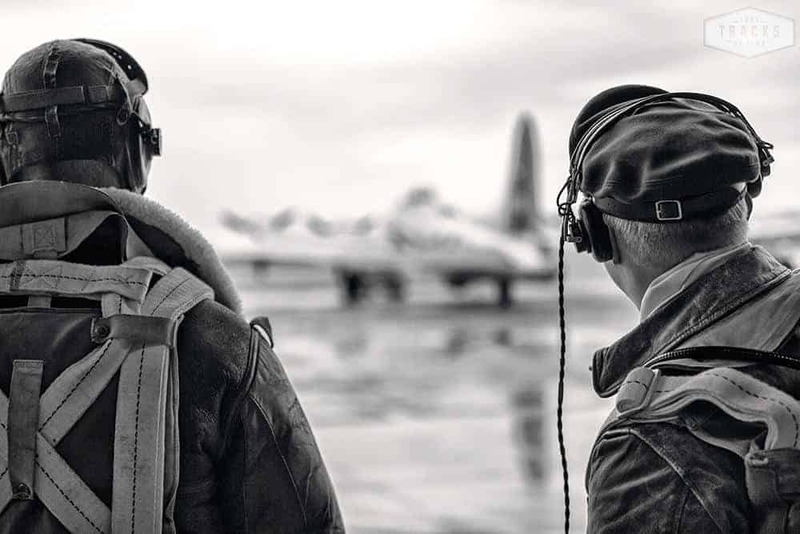 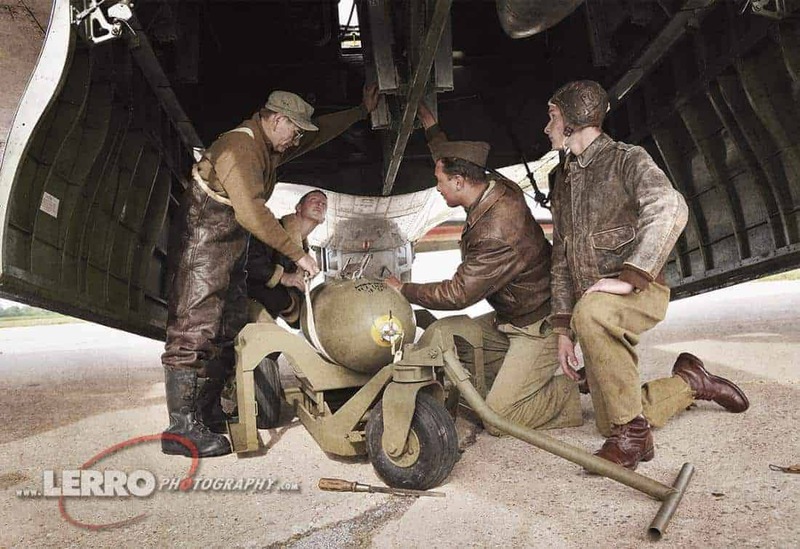 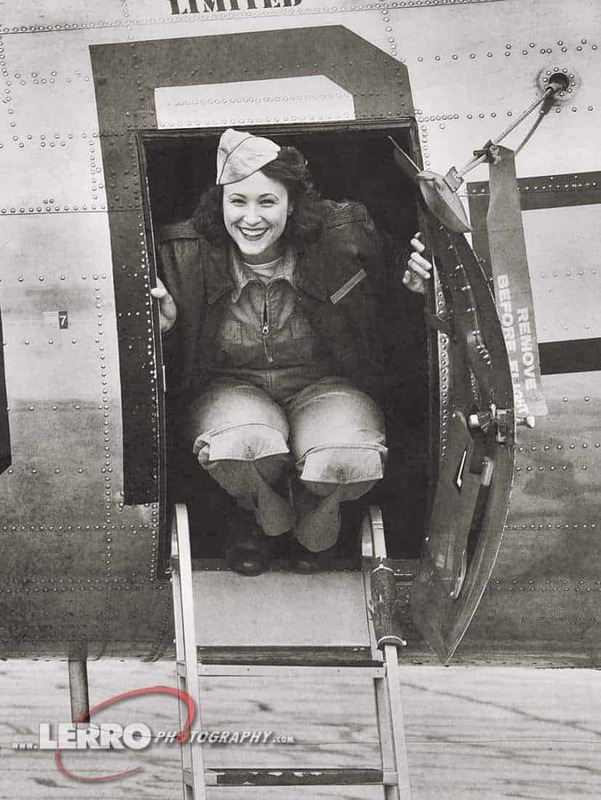 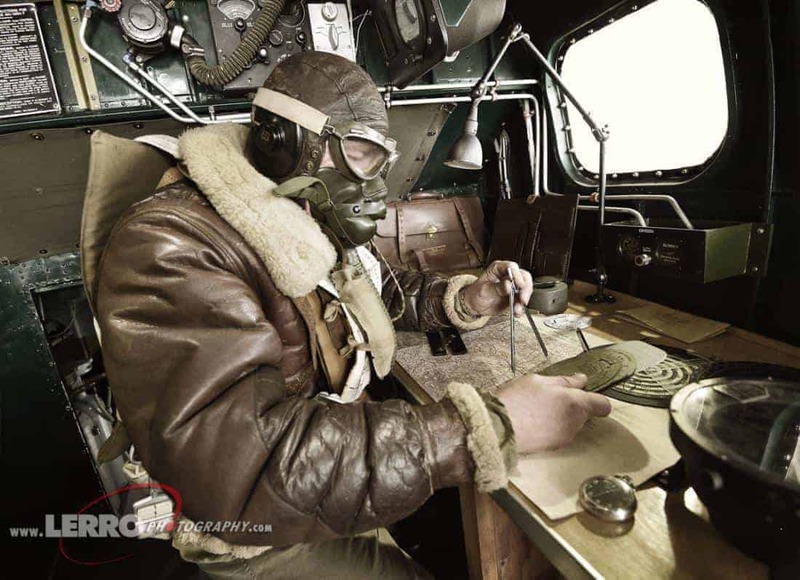 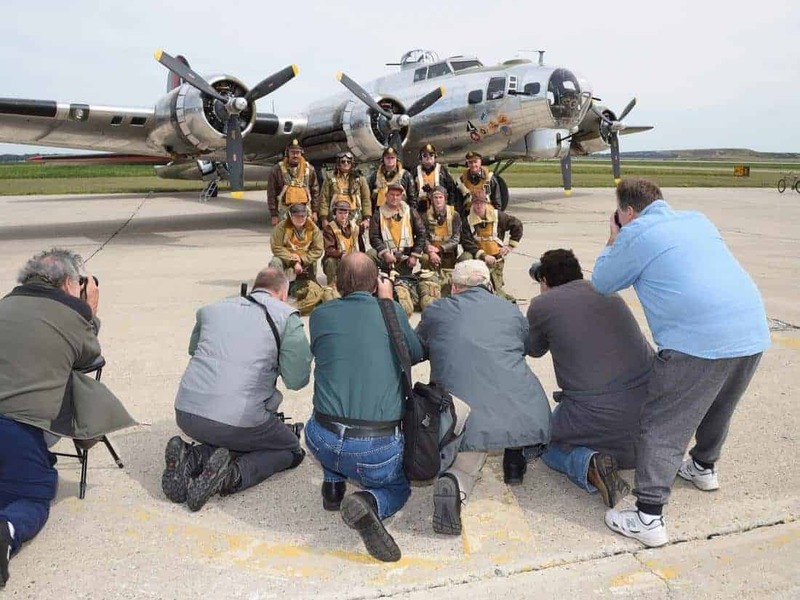 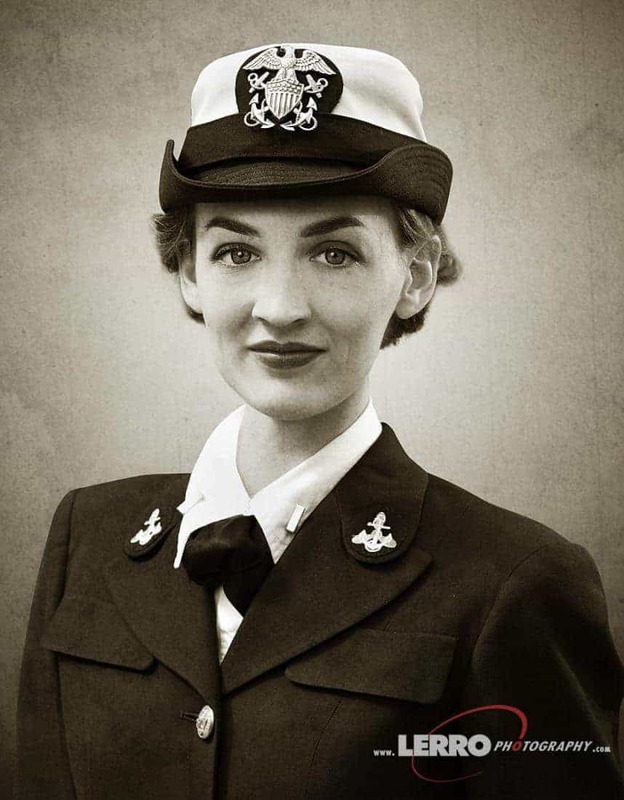 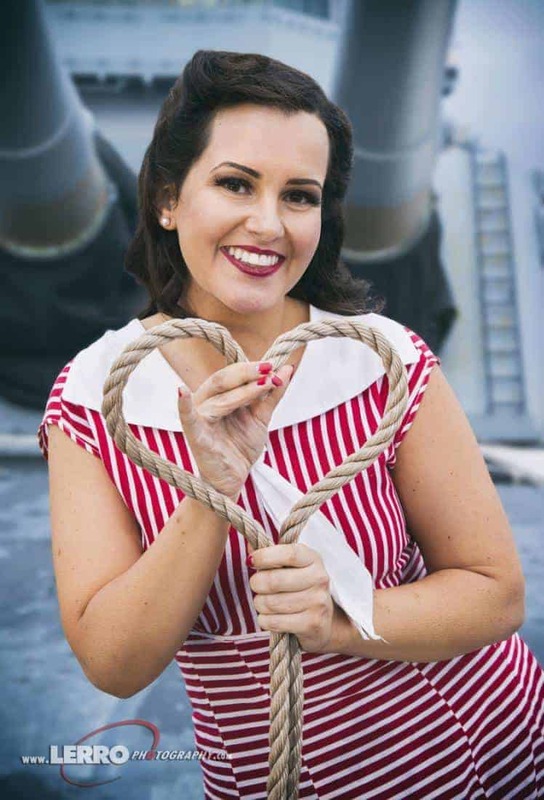 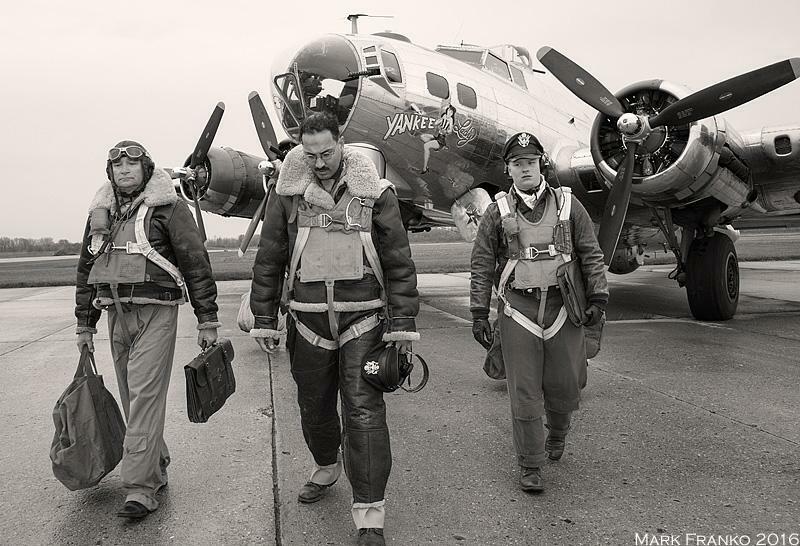 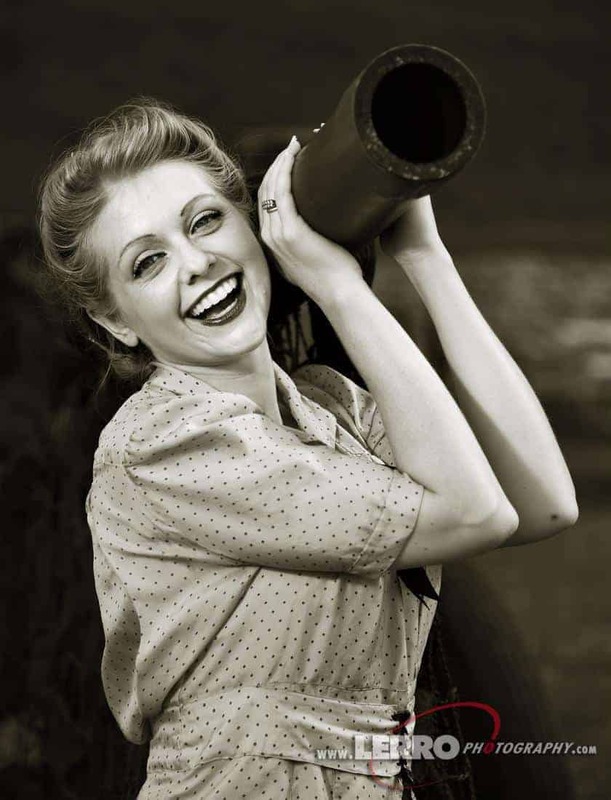 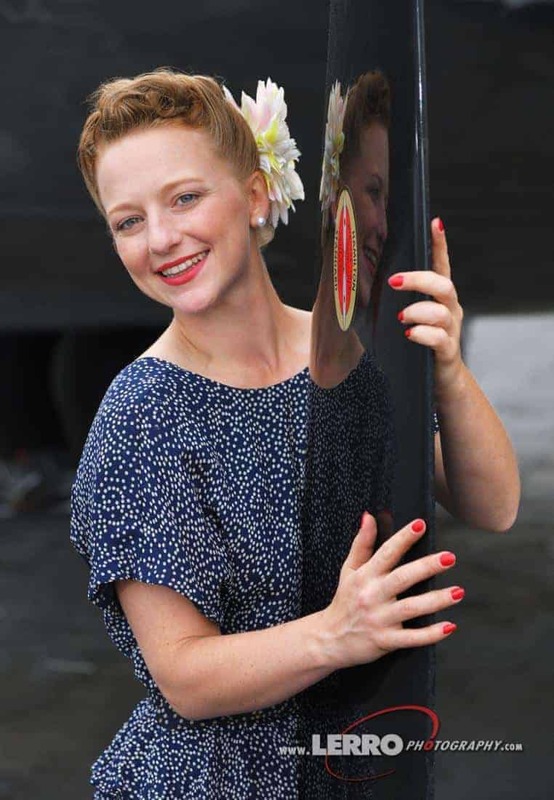 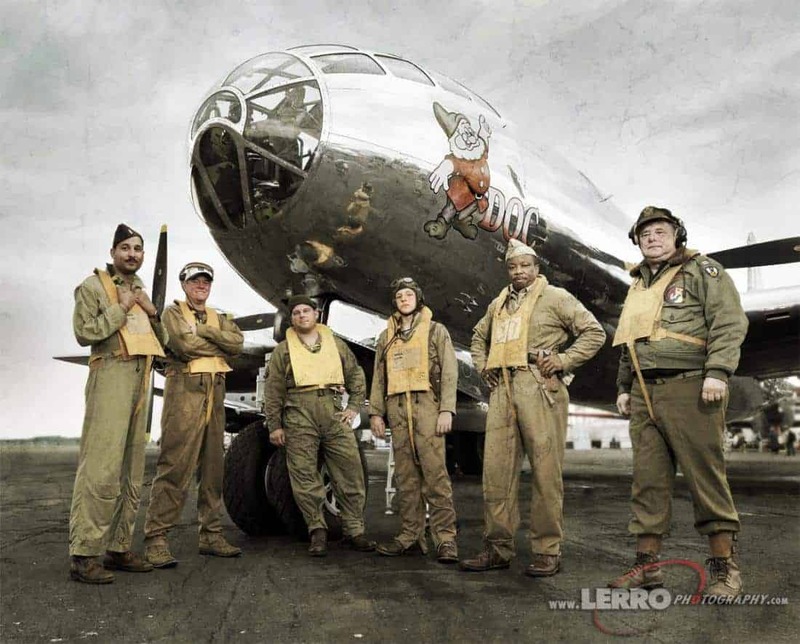 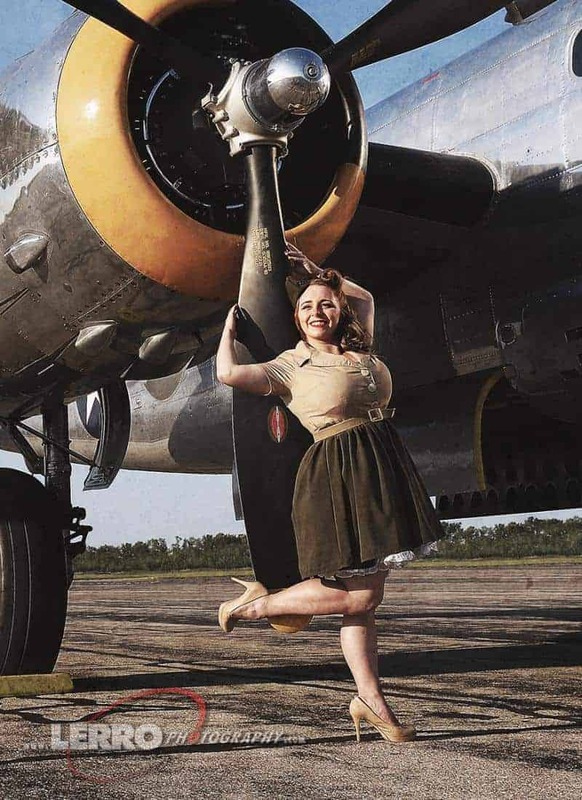 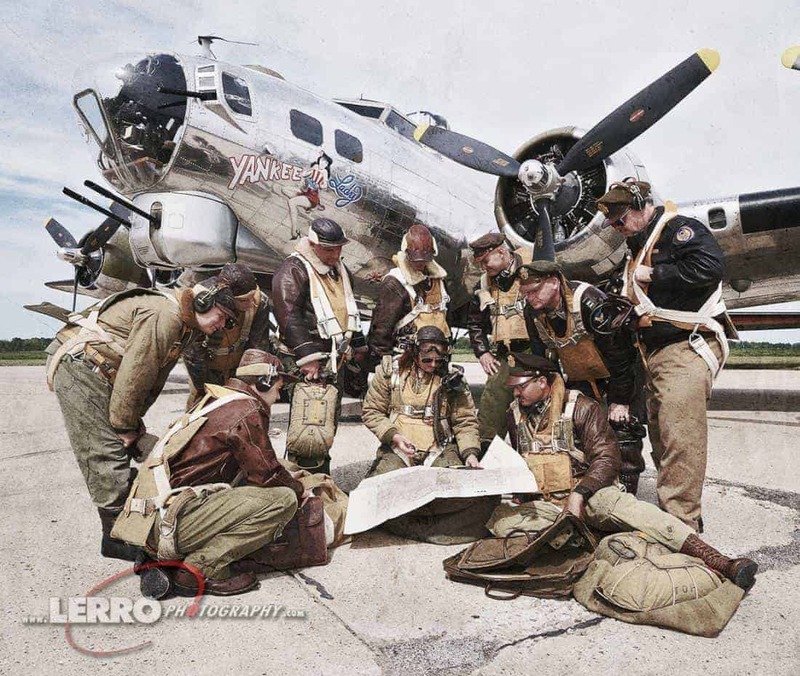 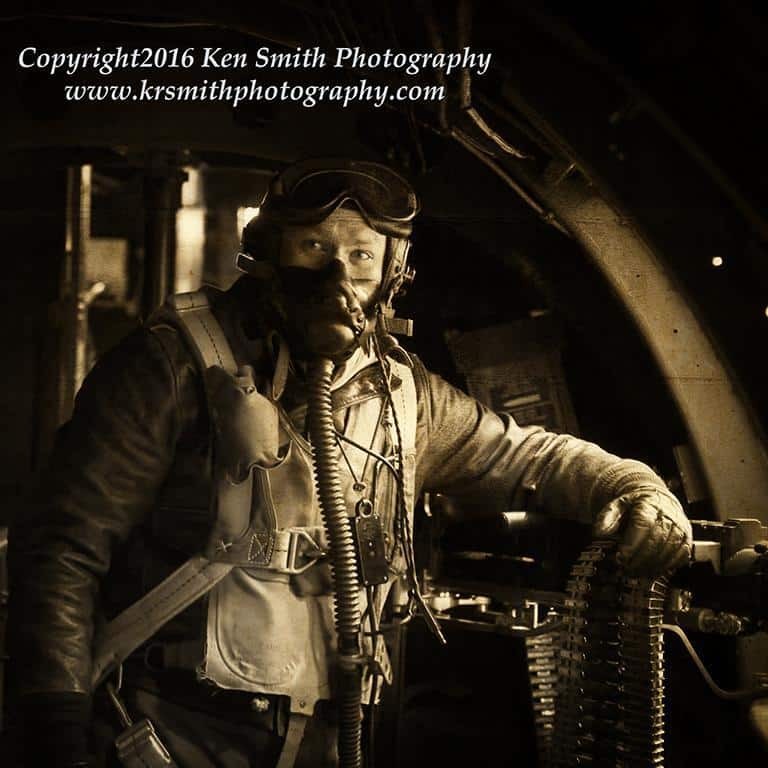 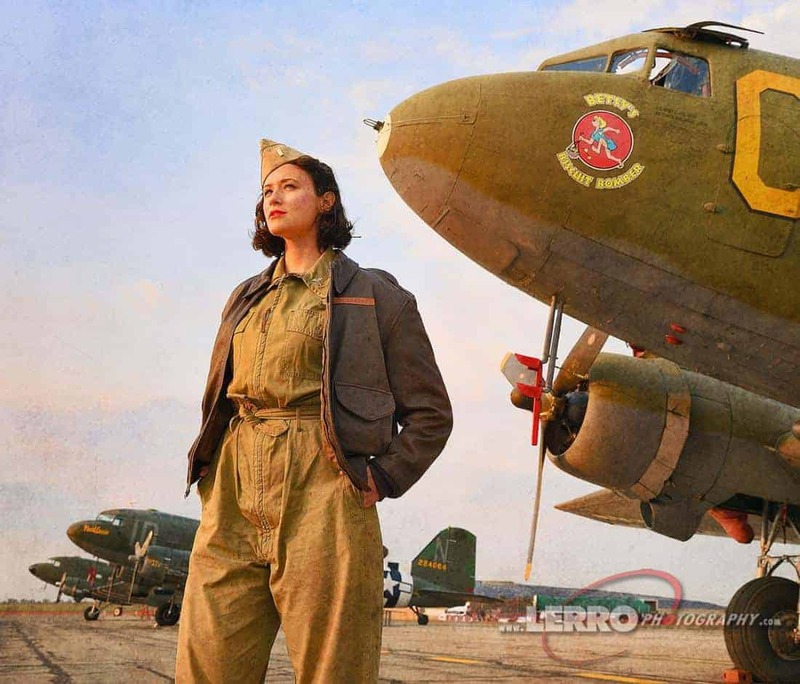 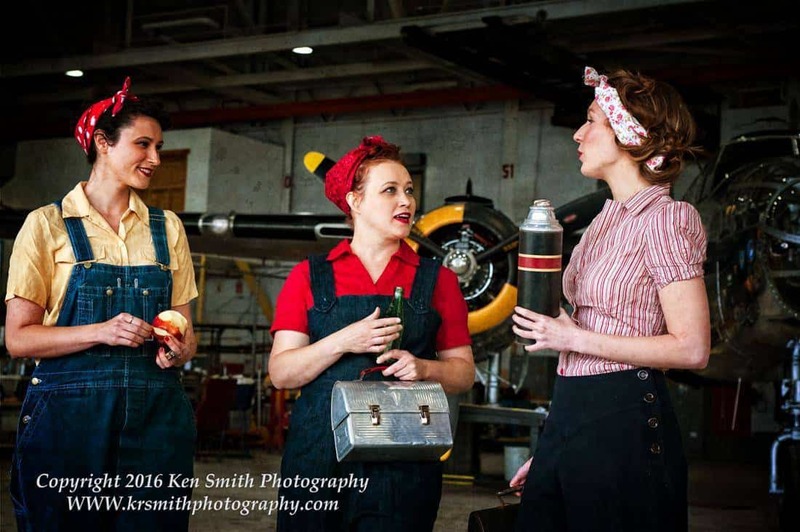 Bombers & Pinups – These shoots take place independently or in conjunction with larger events like airshows. 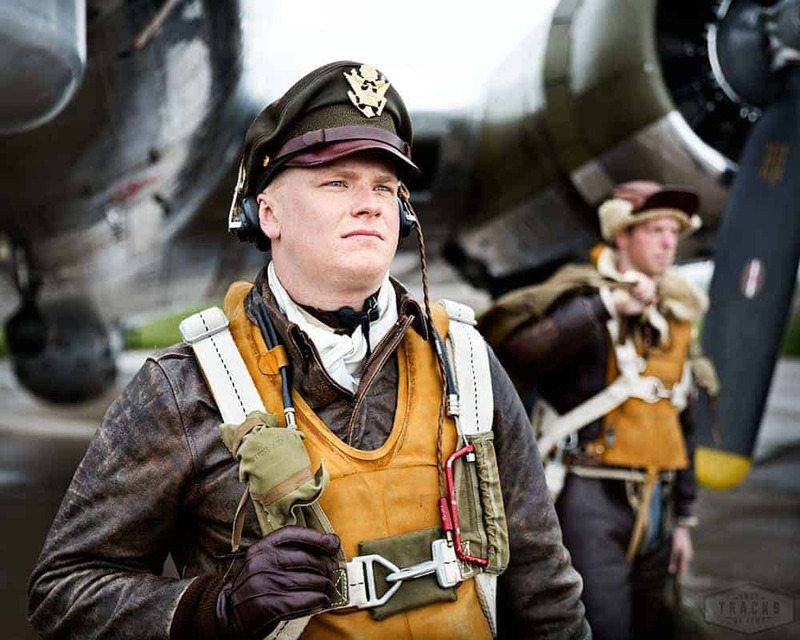 In addition to photographing various planes & artillery, we always have period specific rennactors and models dressed to fit the scene. 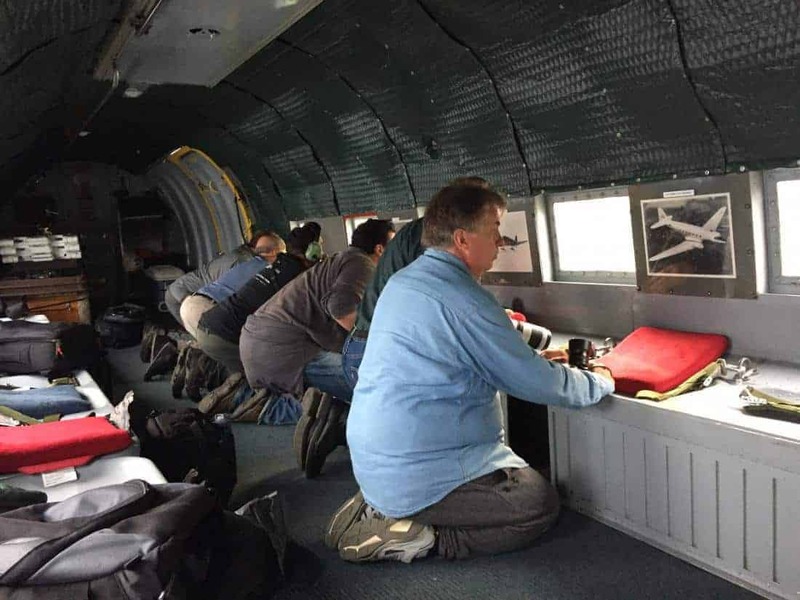 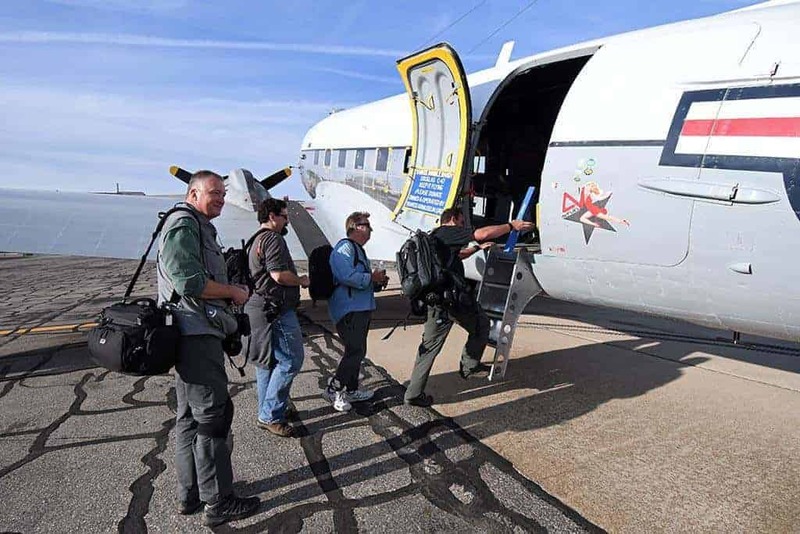 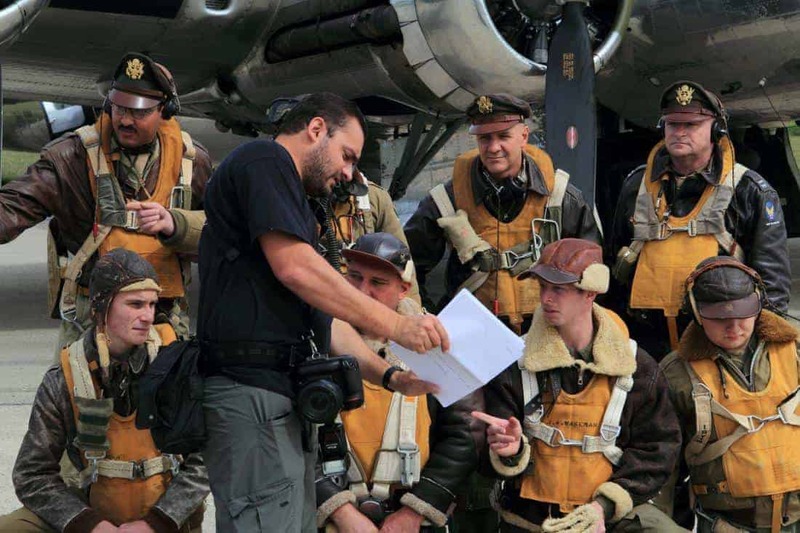 Our photographers will get the chance to take staged shots of: crew portraits, simulated action shots, classy pinup shots as well as possible in flight shots. 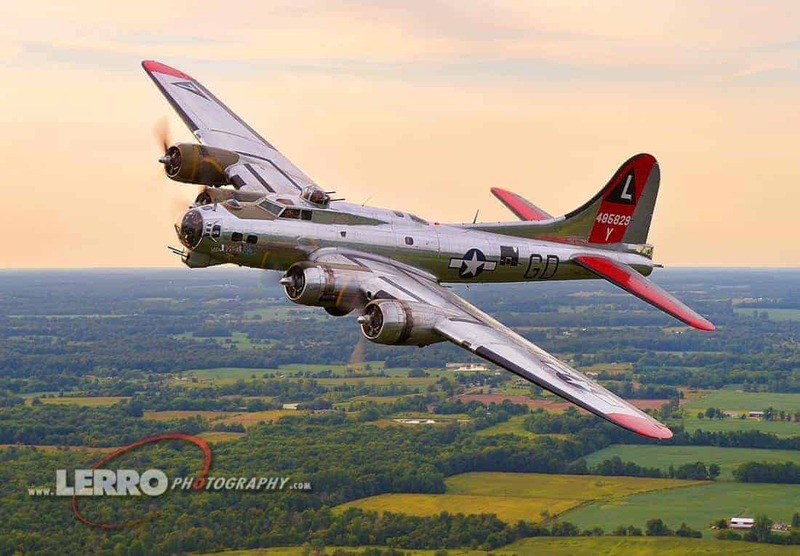 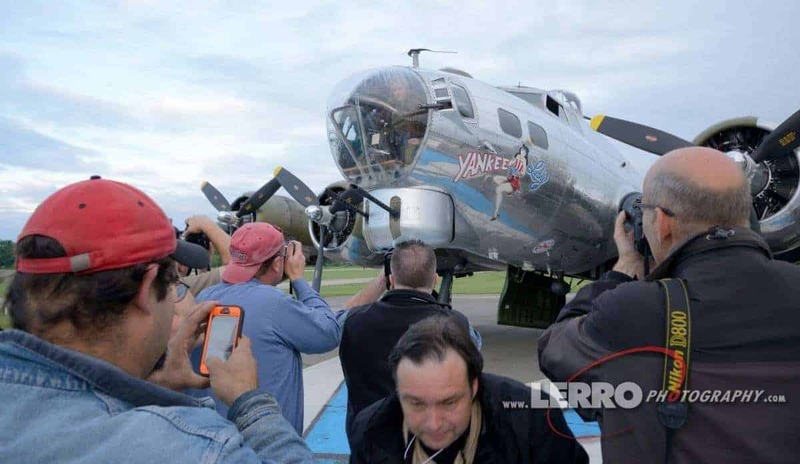 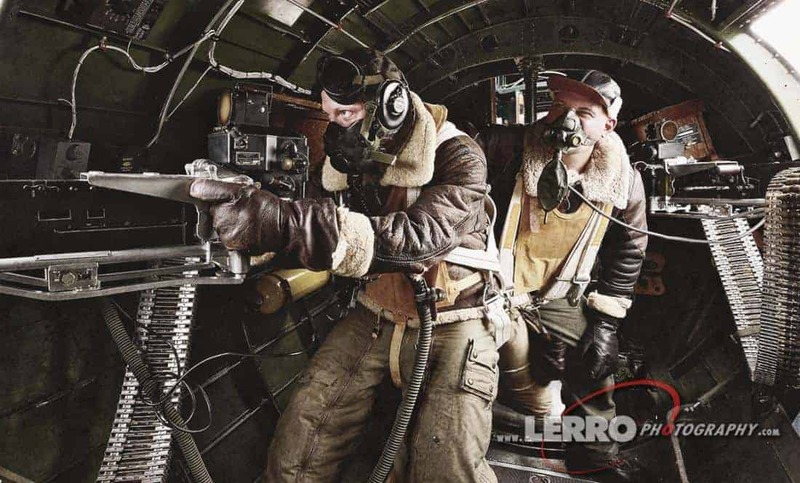 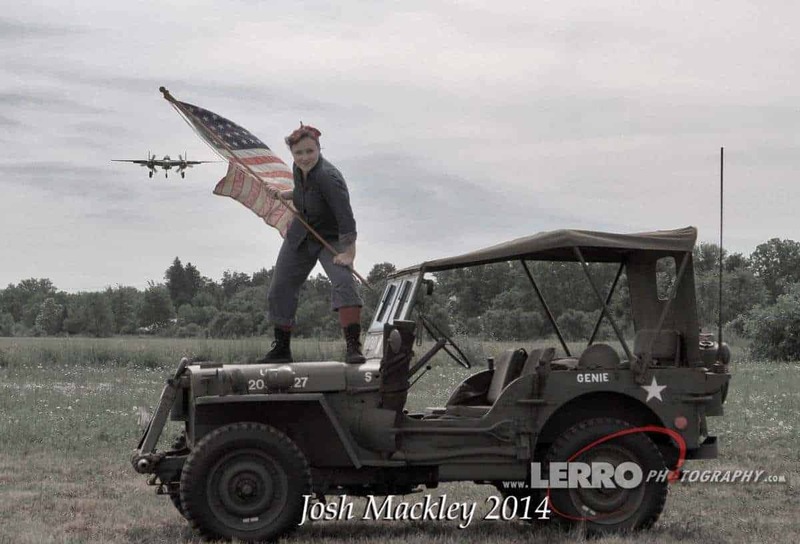 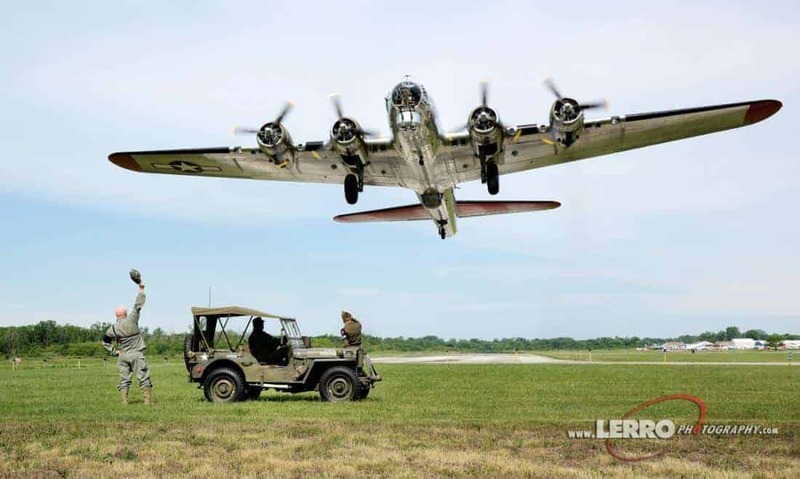 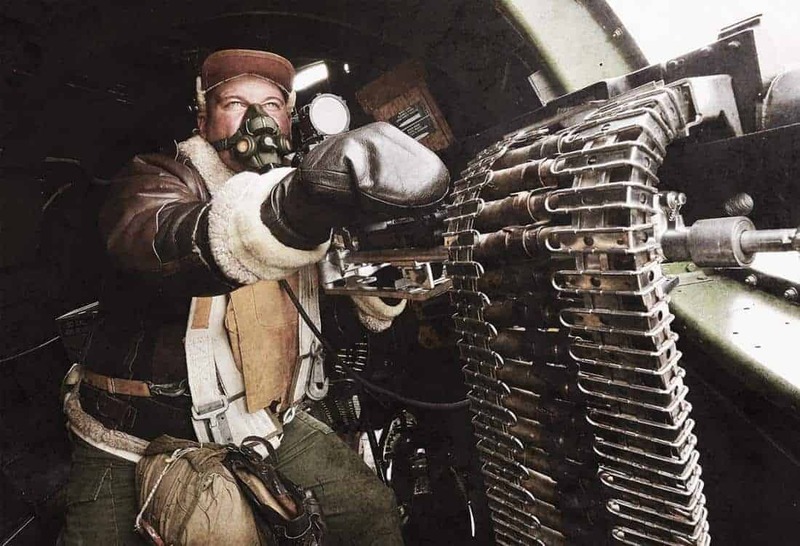 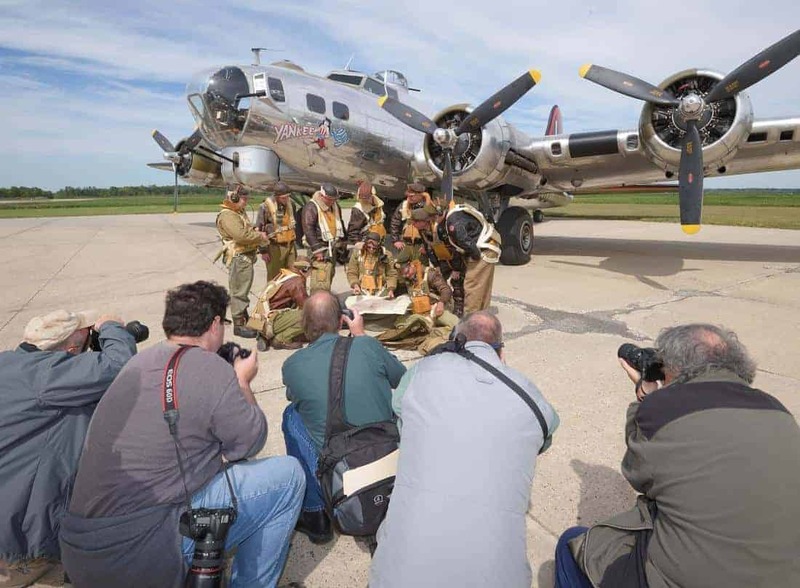 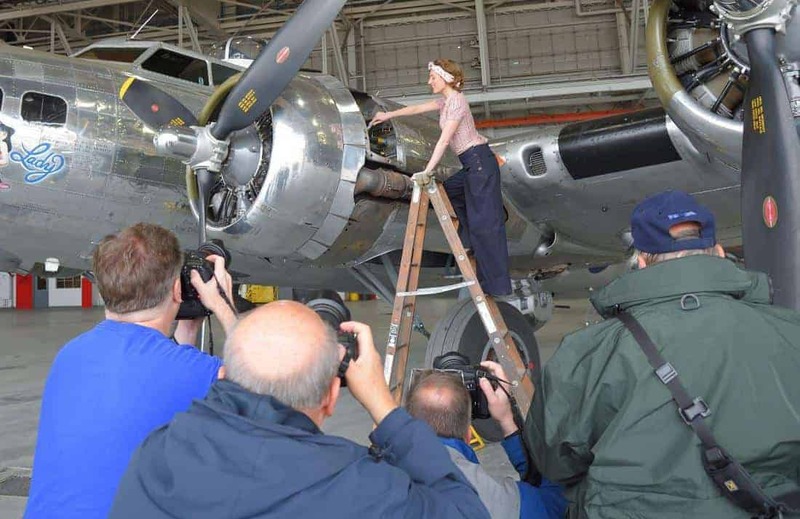 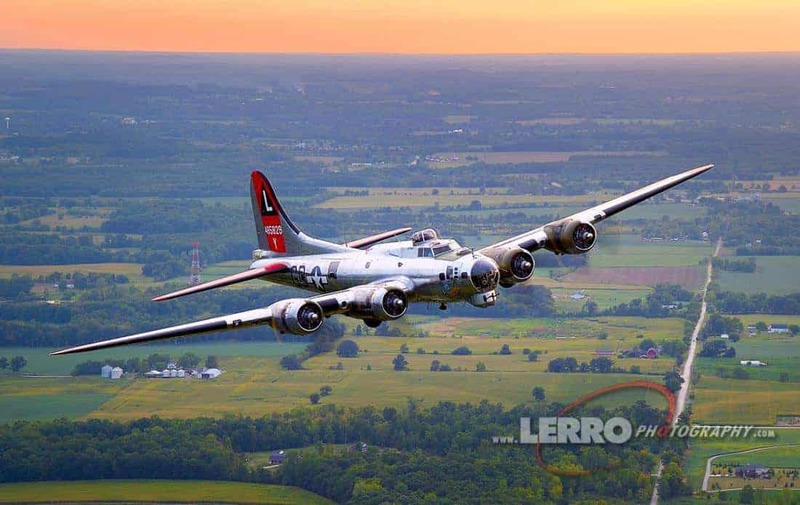 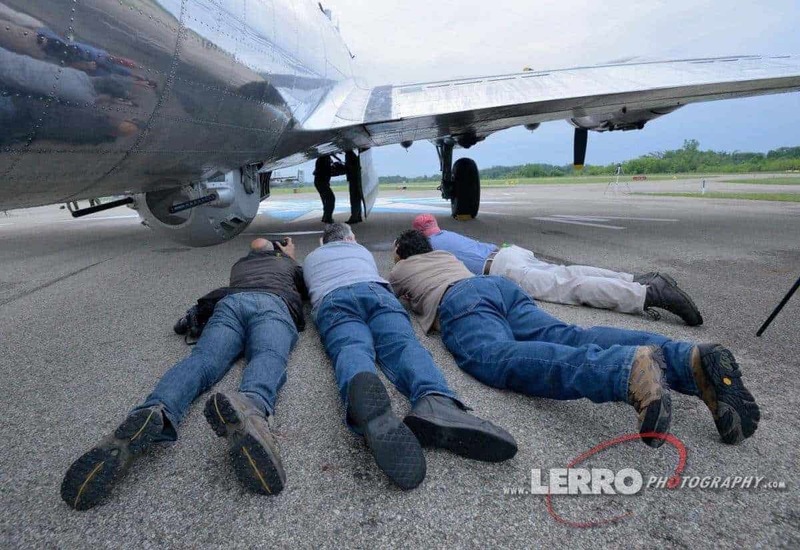 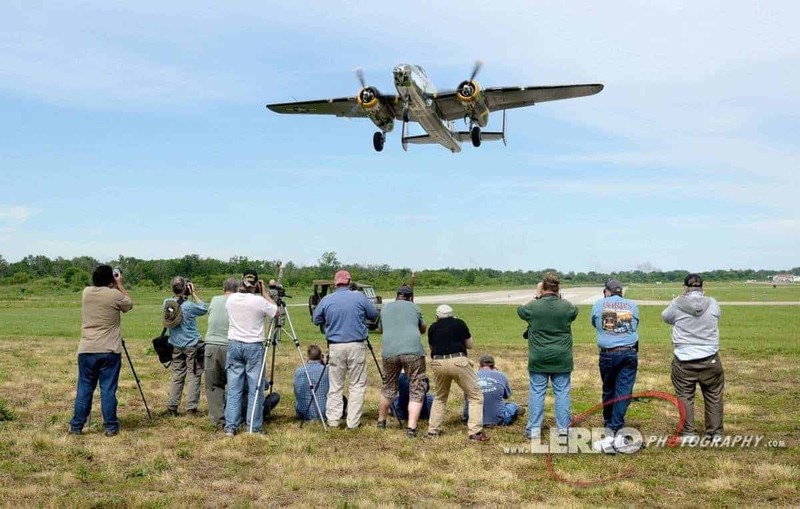 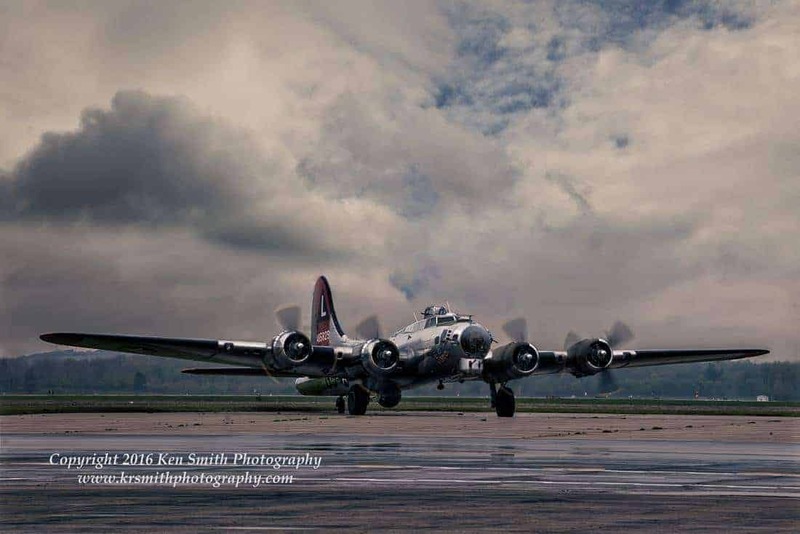 We recently had the pleasure of setting up an air to air shoot with the B-17 Yankee Lady at the Yankee Air Museum. 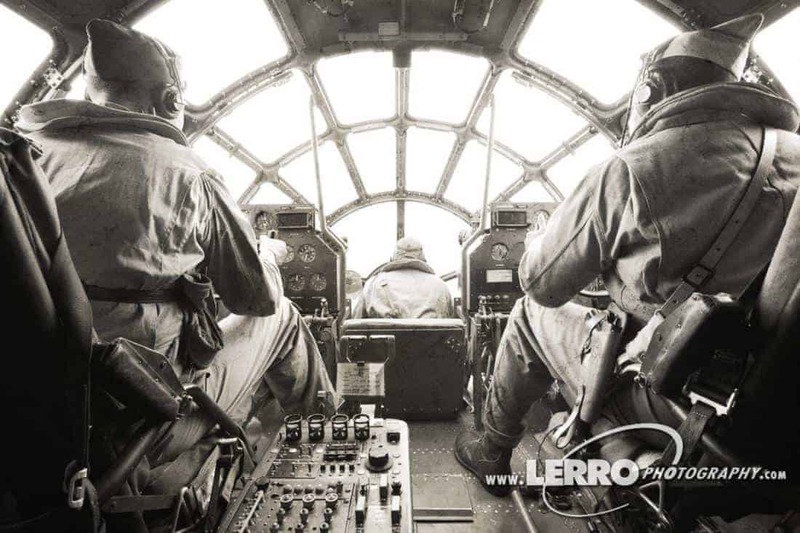 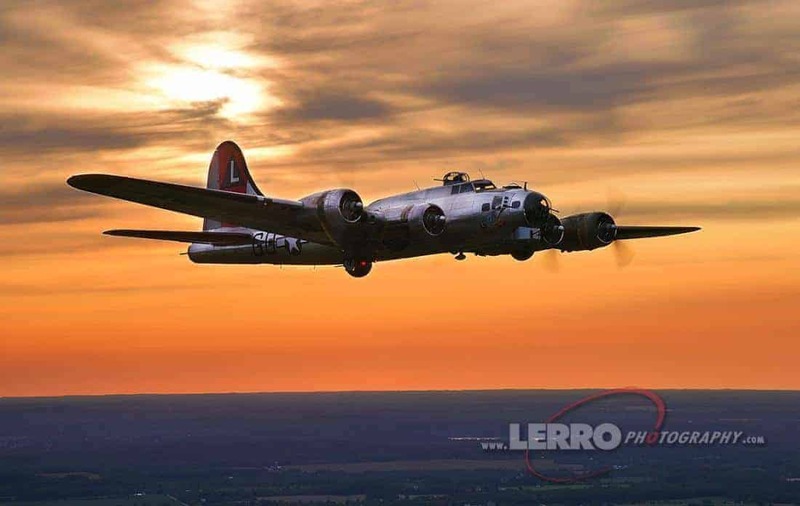 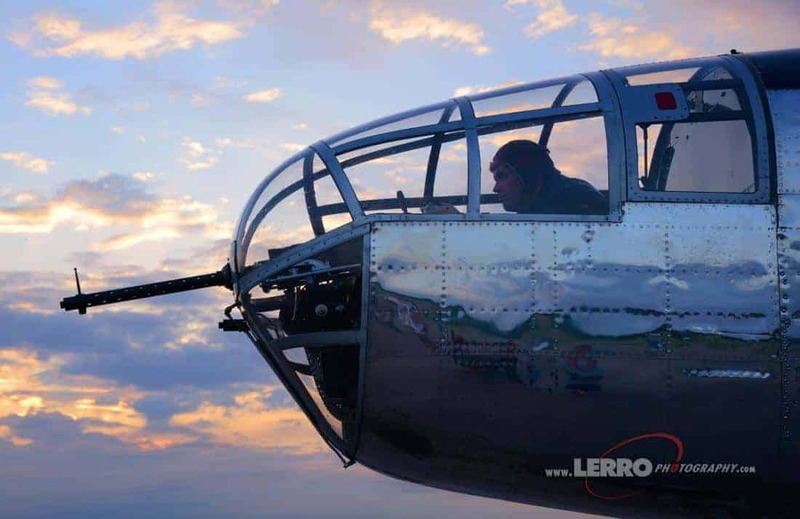 We had the remarkable opportunity of flying in a C-47 and flew along side the B-17 at sunset for a full hour. 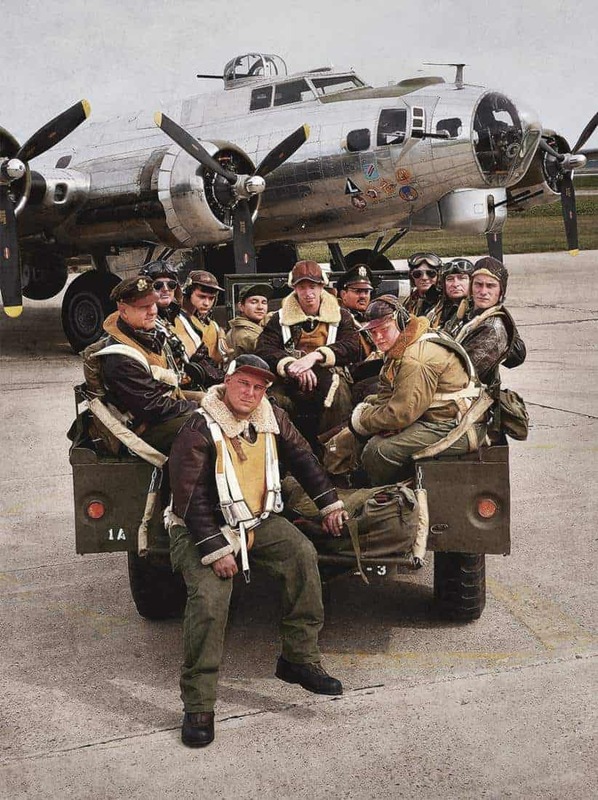 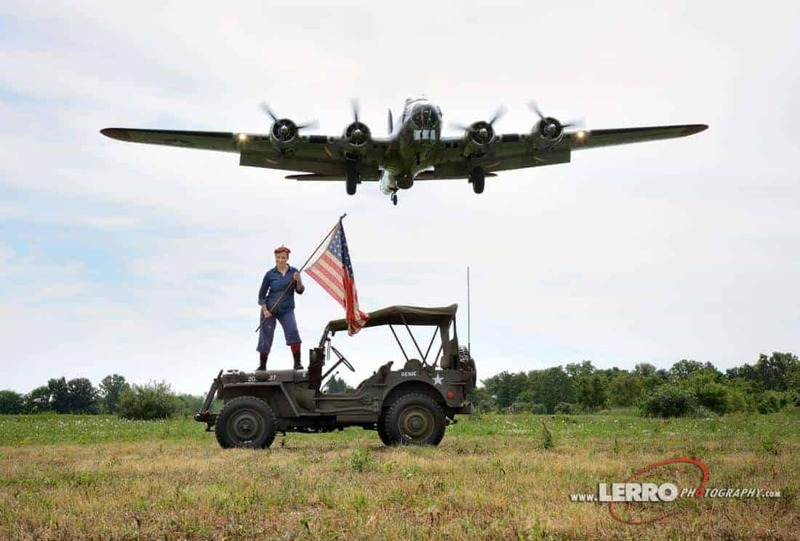 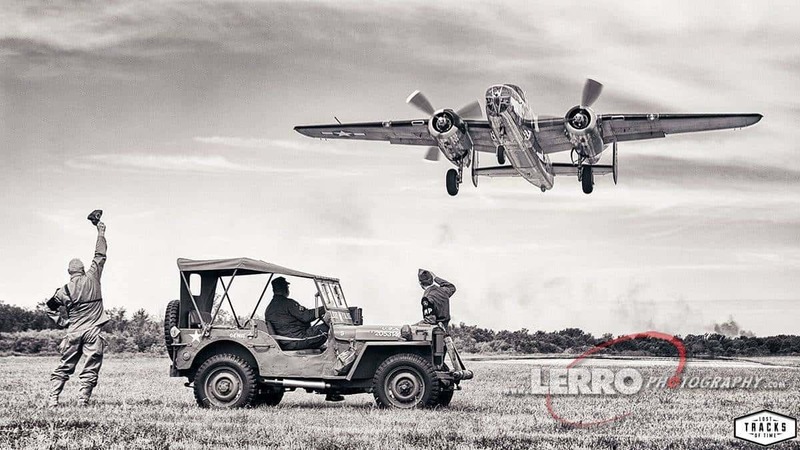 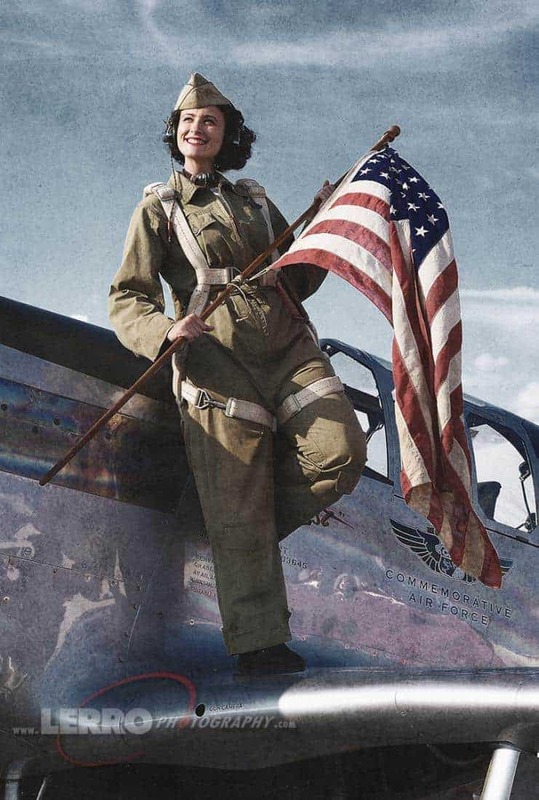 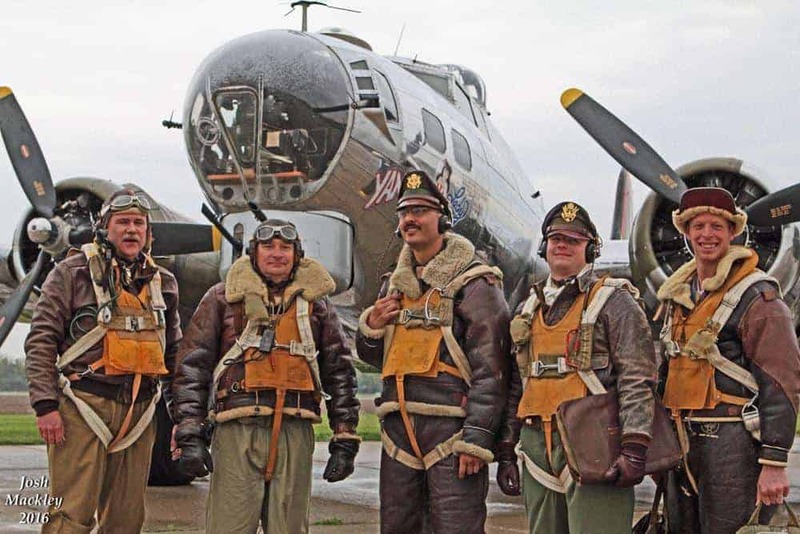 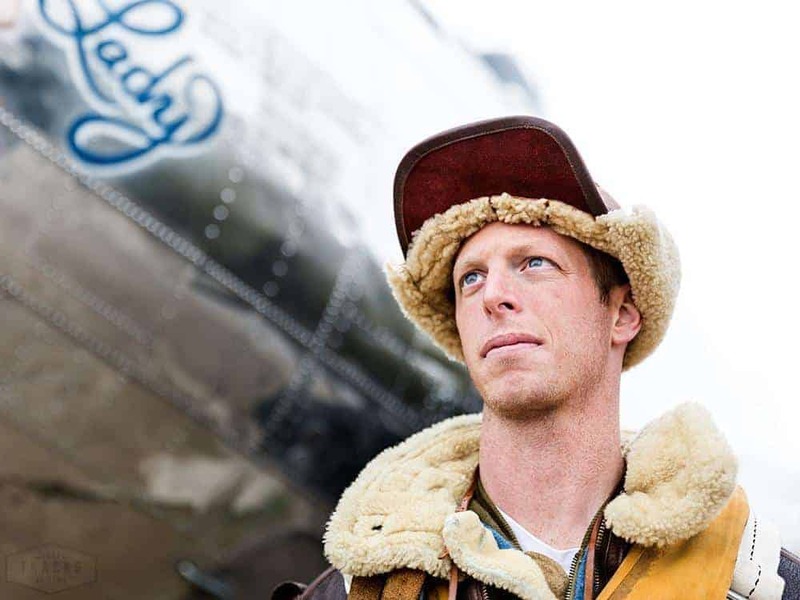 Our photoshoot also included 4 hours of ground shots with 10 flight crew reenactsors as well as ground crew and several women dressed up in period clothing. 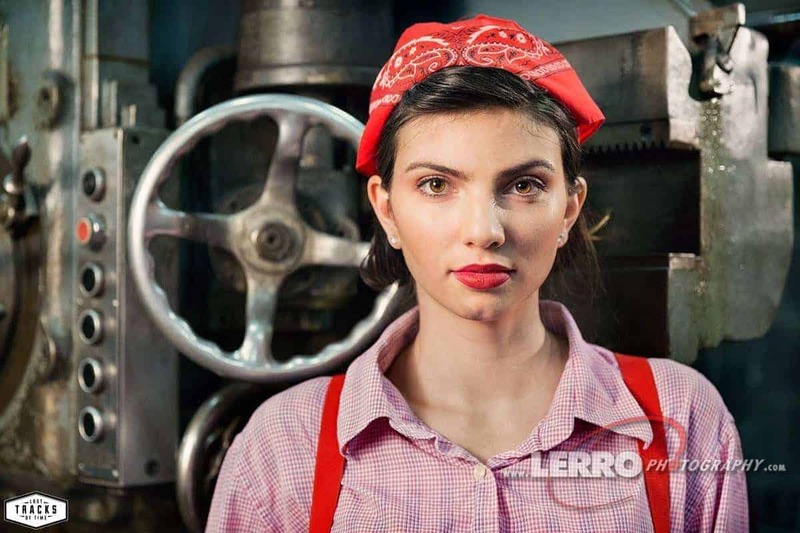 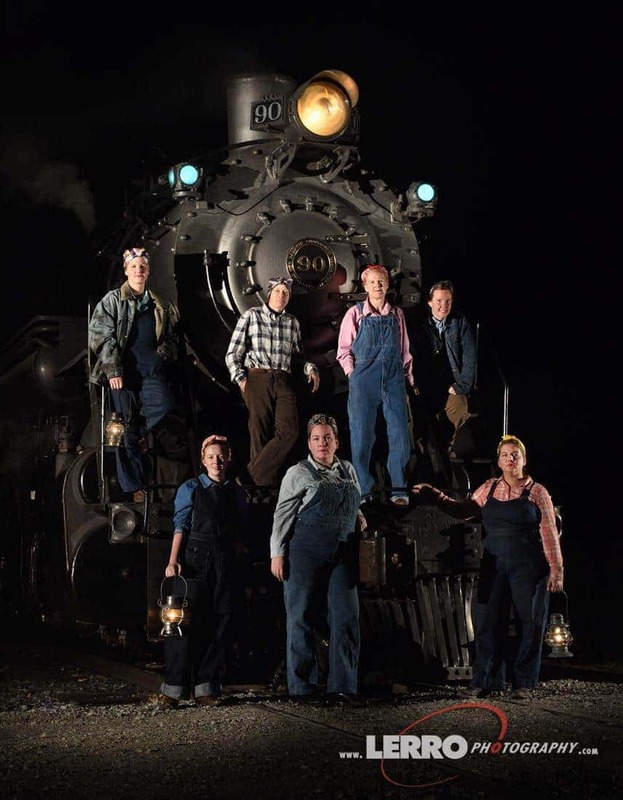 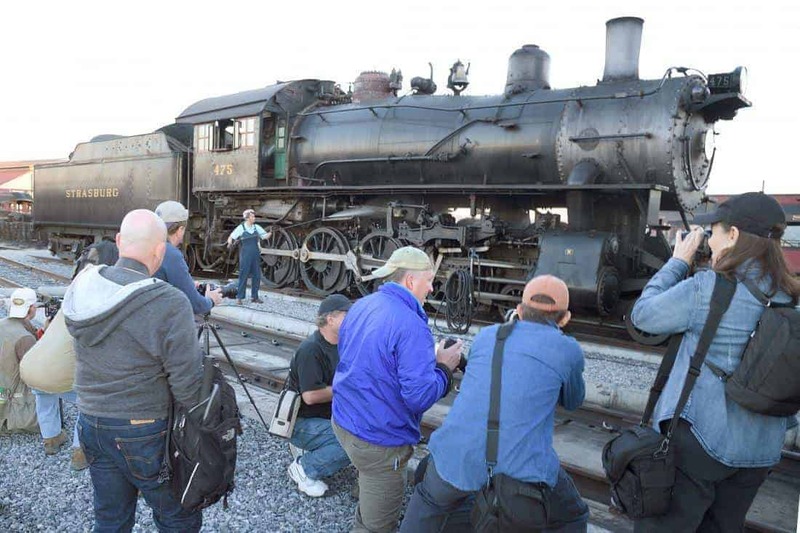 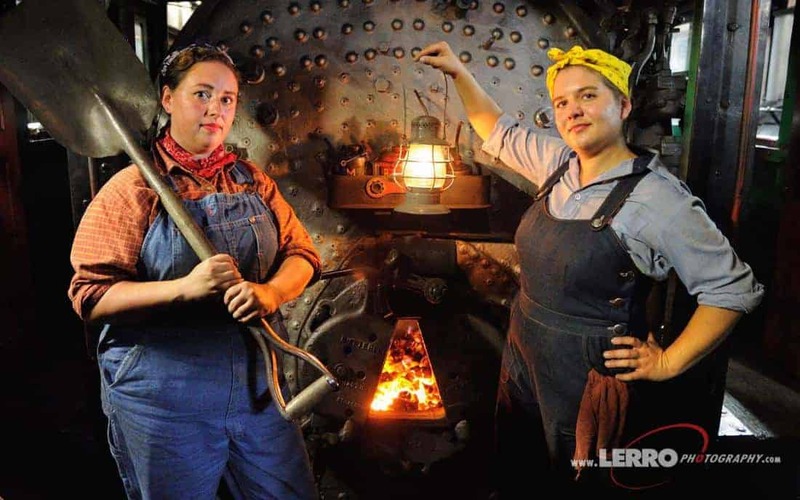 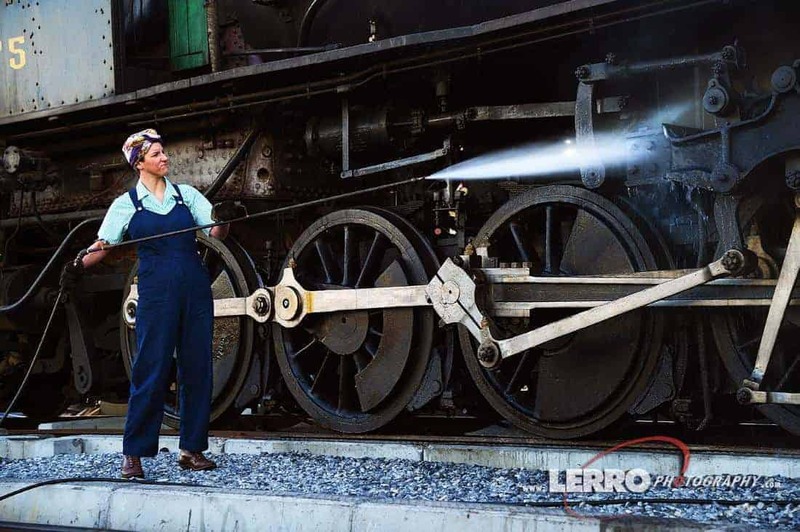 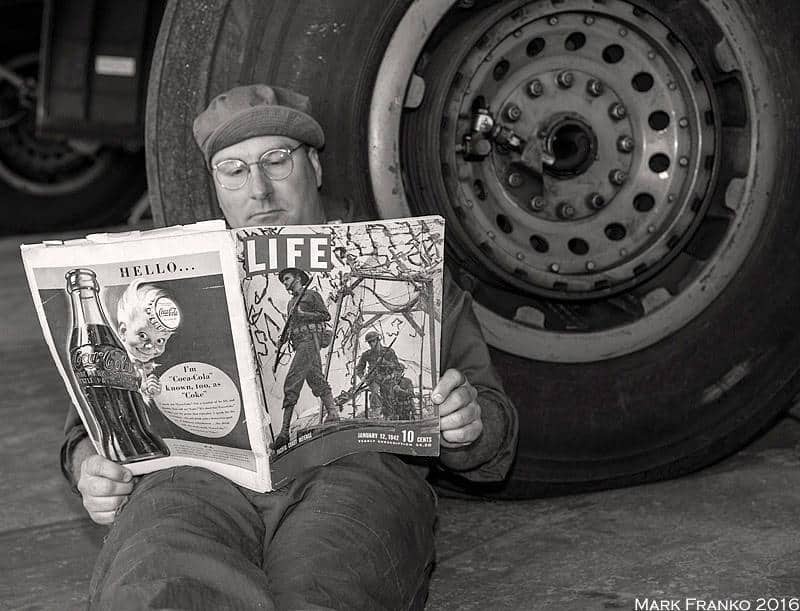 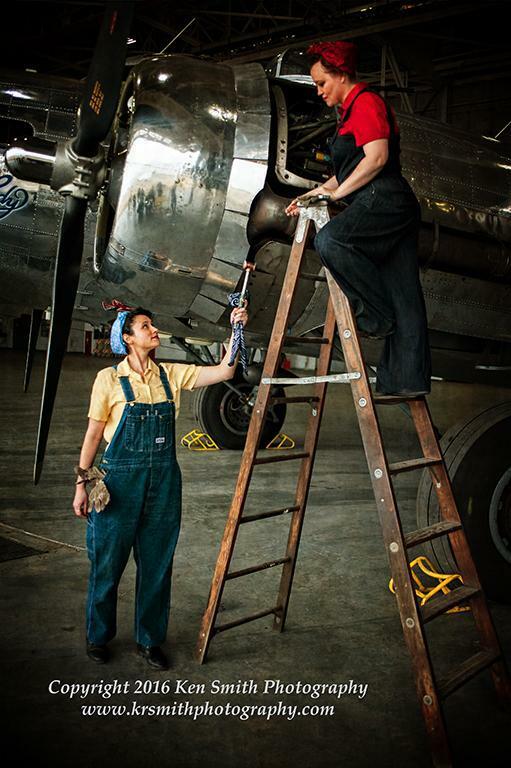 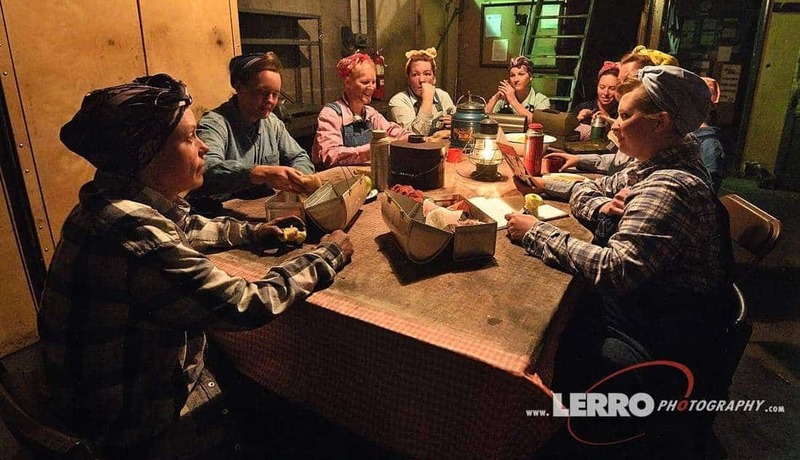 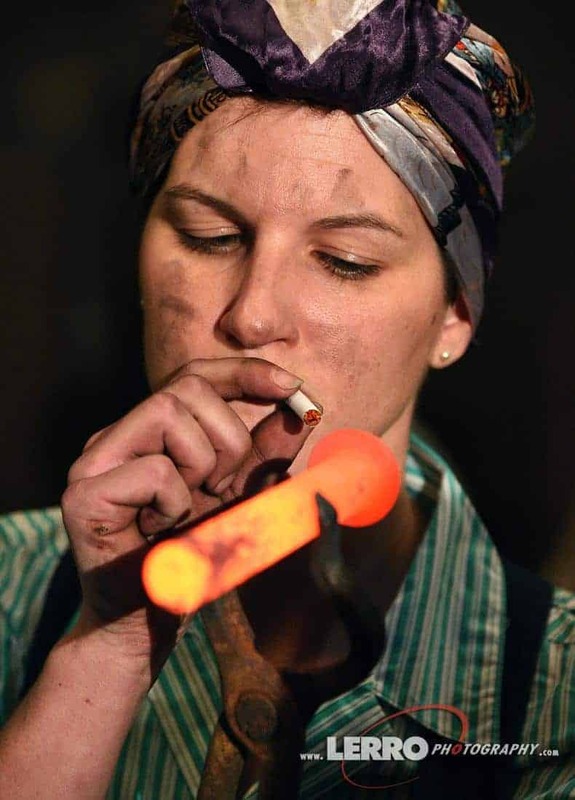 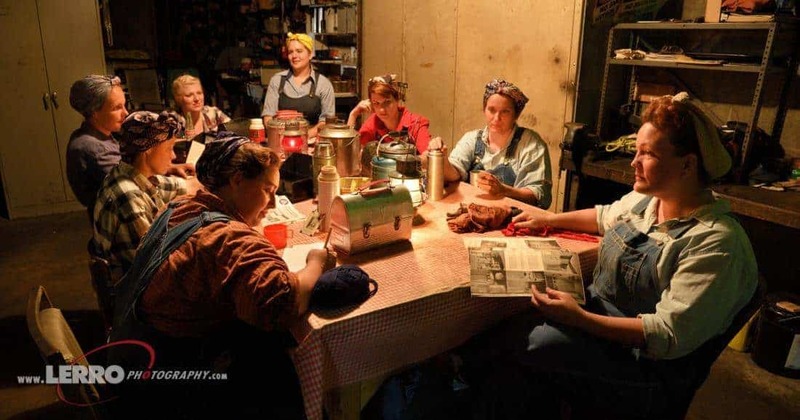 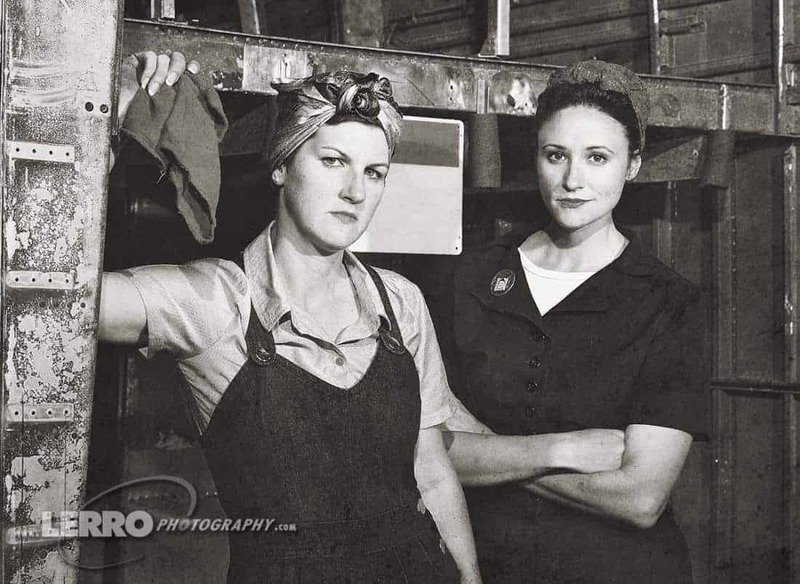 Rosie the Riveter – During our Rosie shoots, we’ve not only had the good fortune to work with great reenactors, but also with present day female railroaders and machinists. 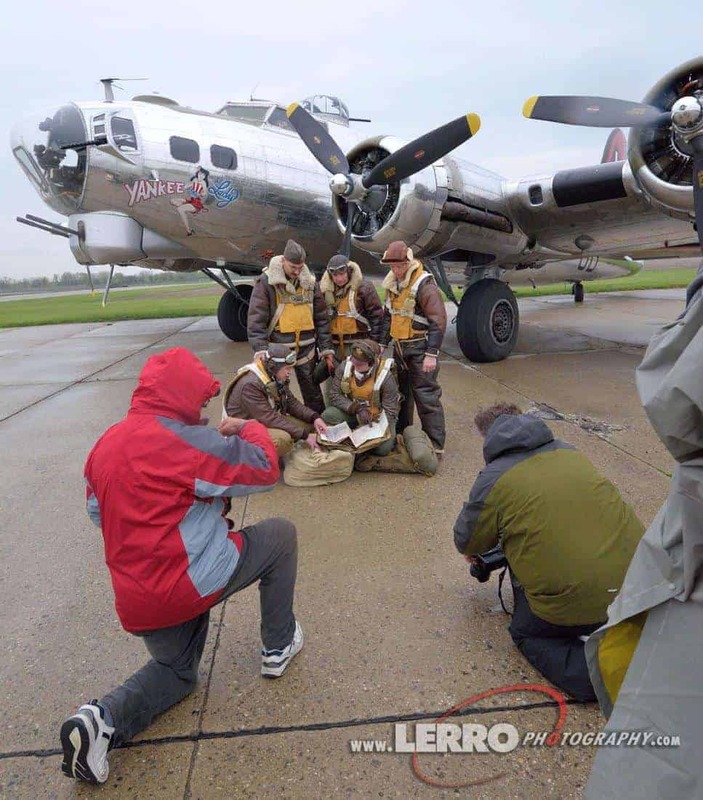 These special details ensure that each of our shoots have a level of realism and genuineness that many others lack. 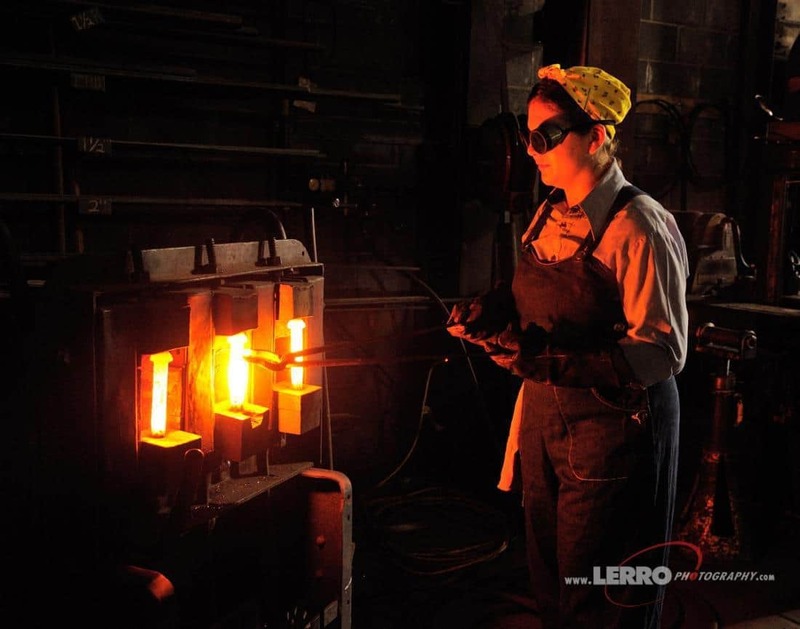 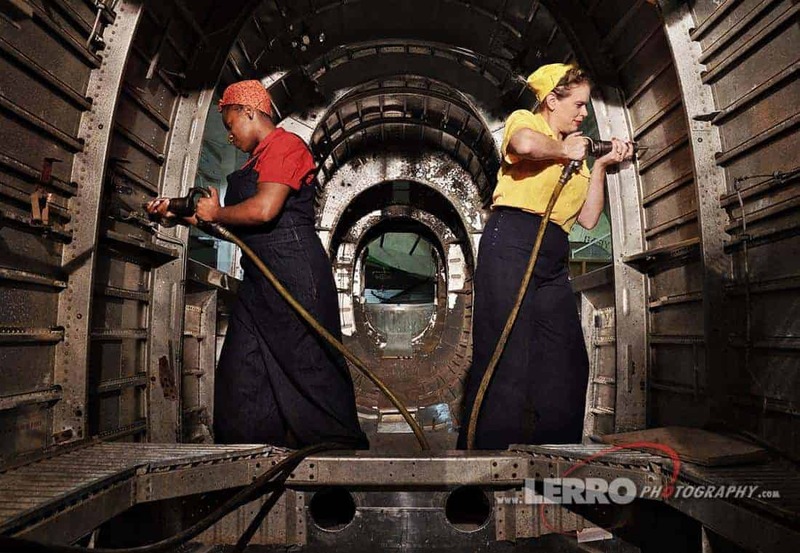 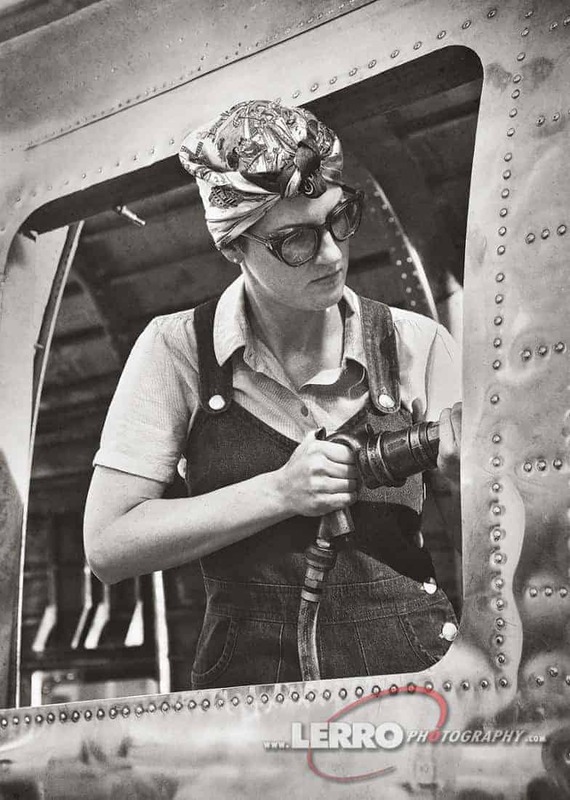 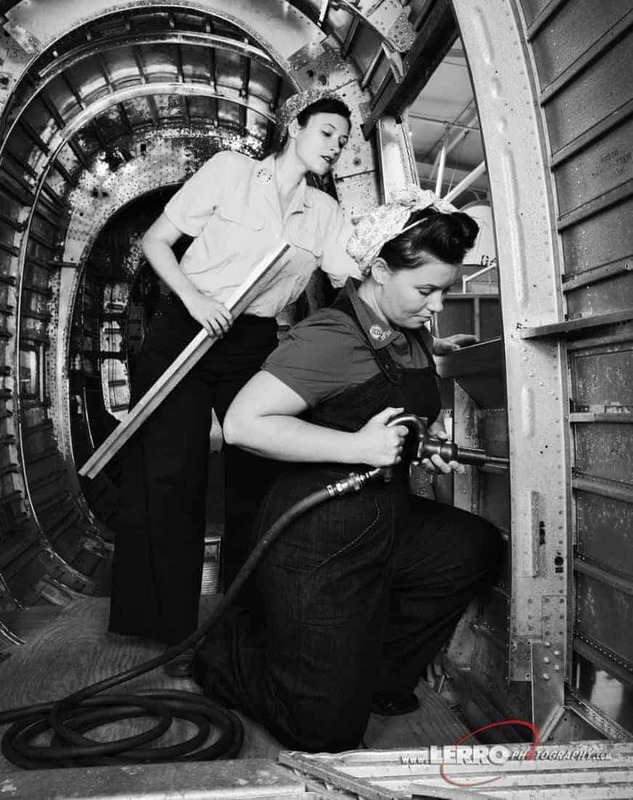 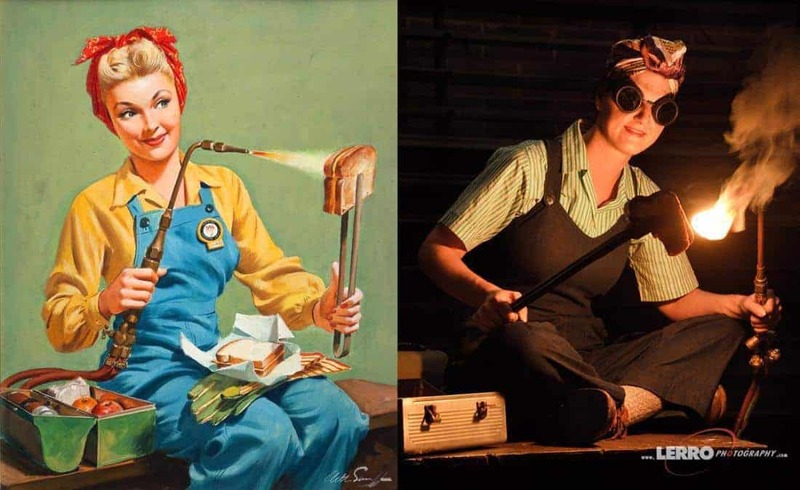 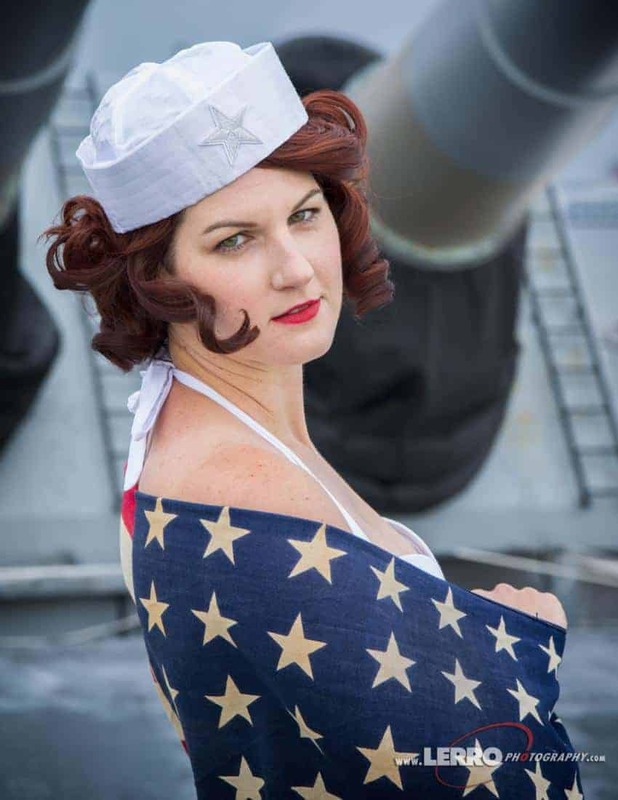 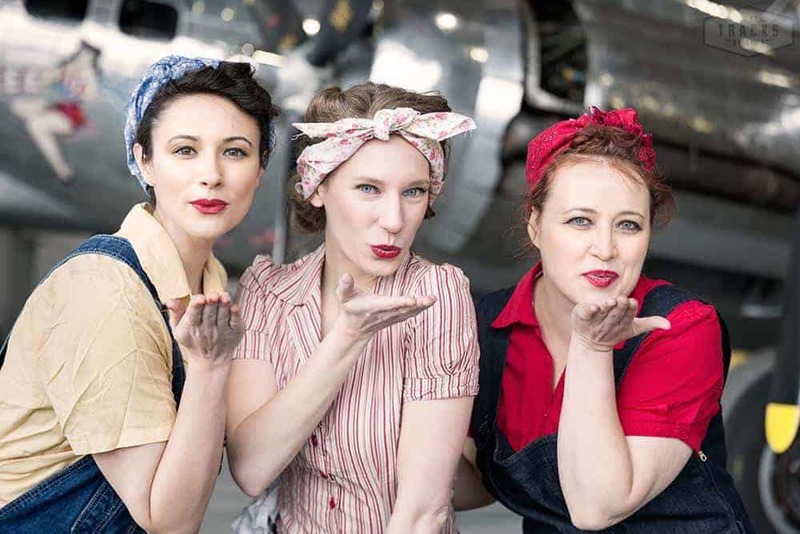 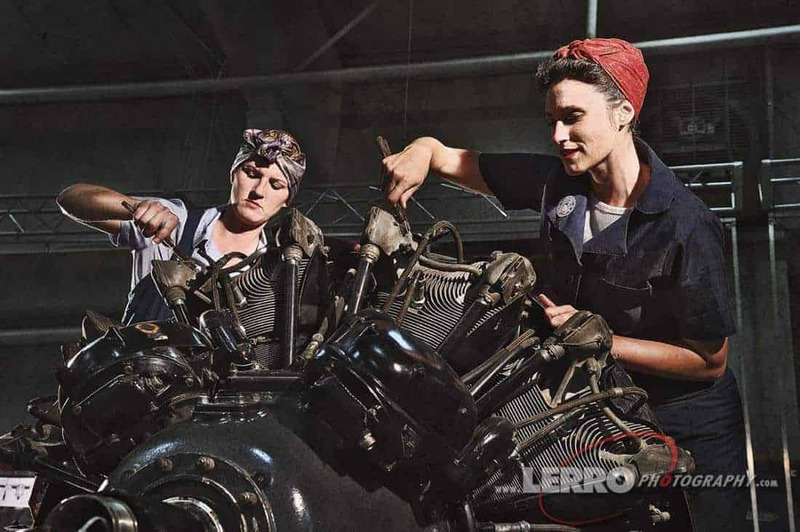 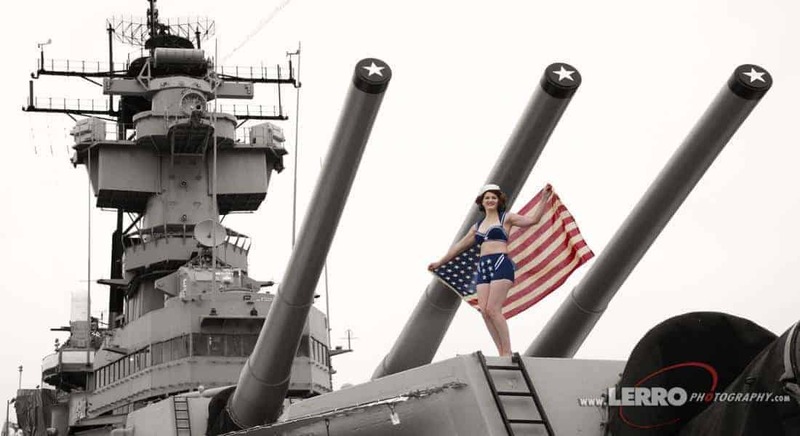 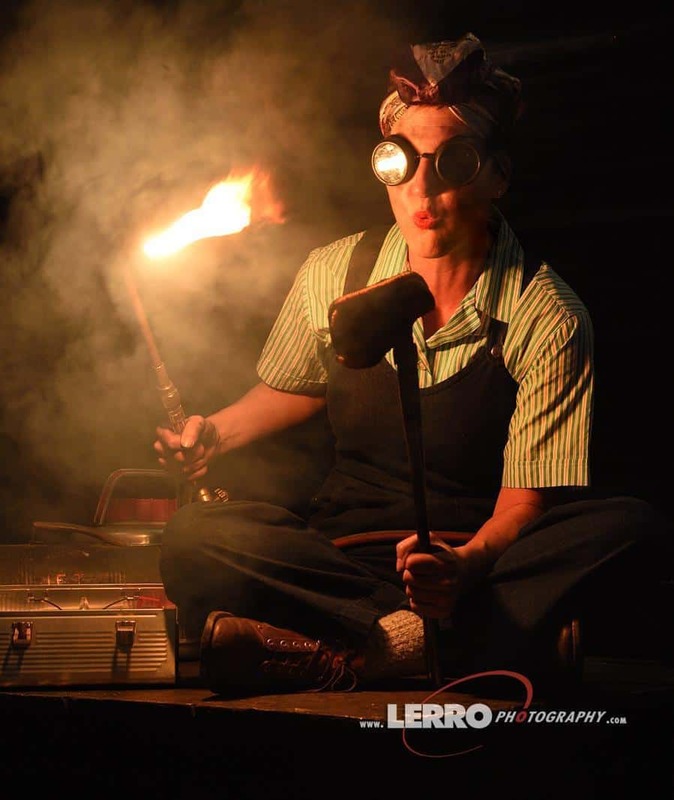 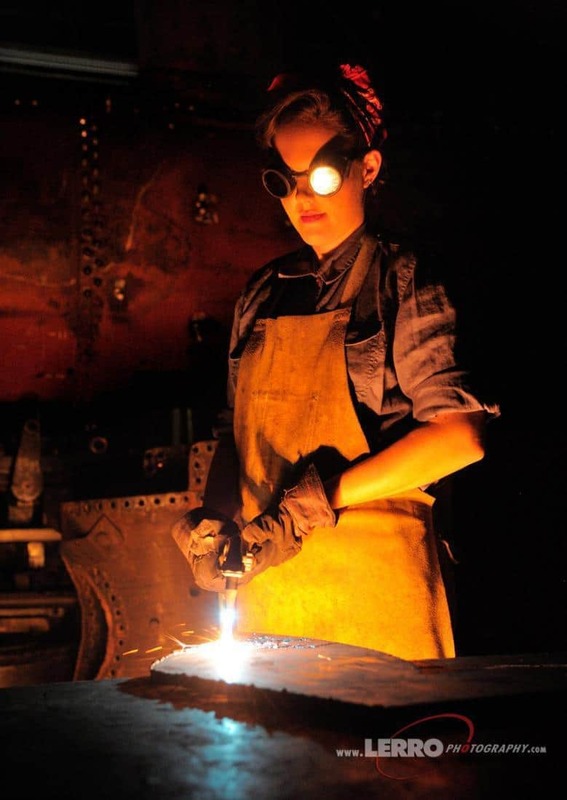 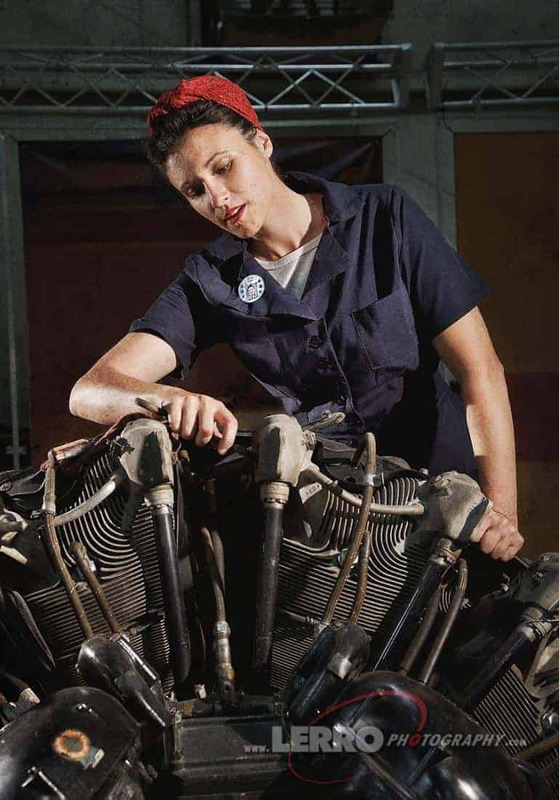 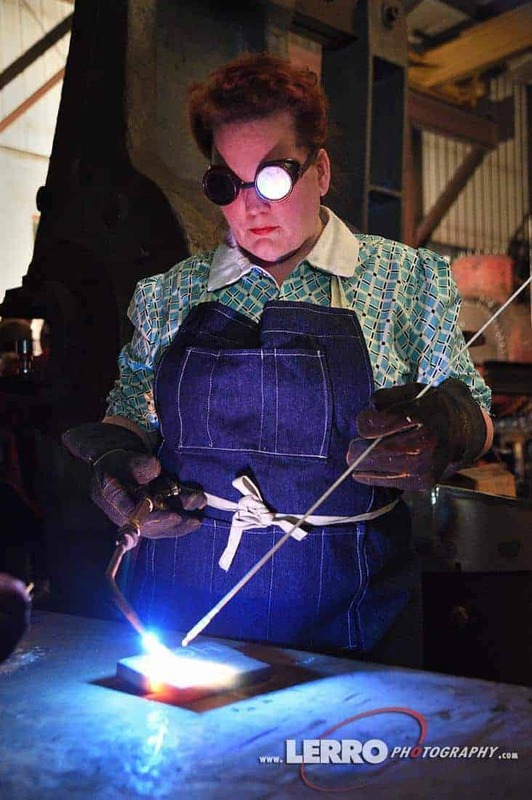 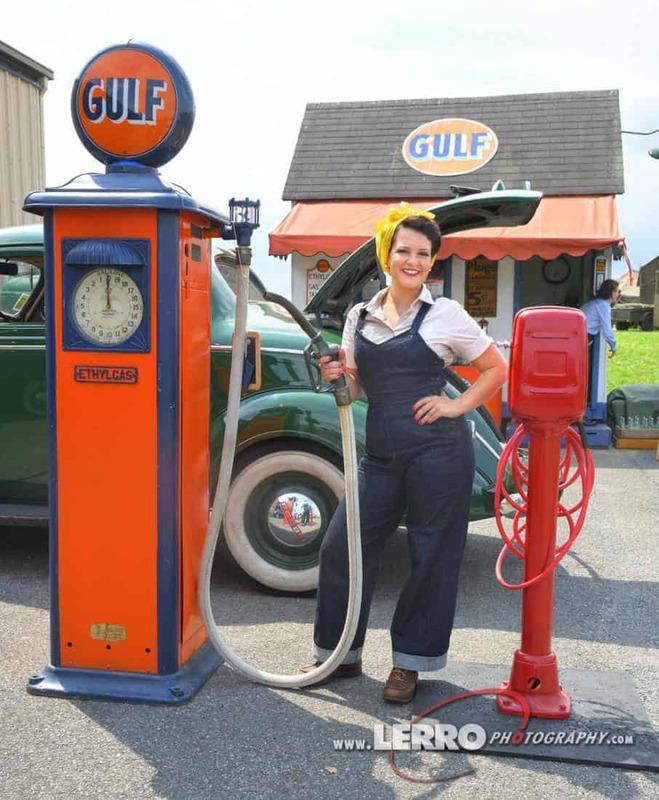 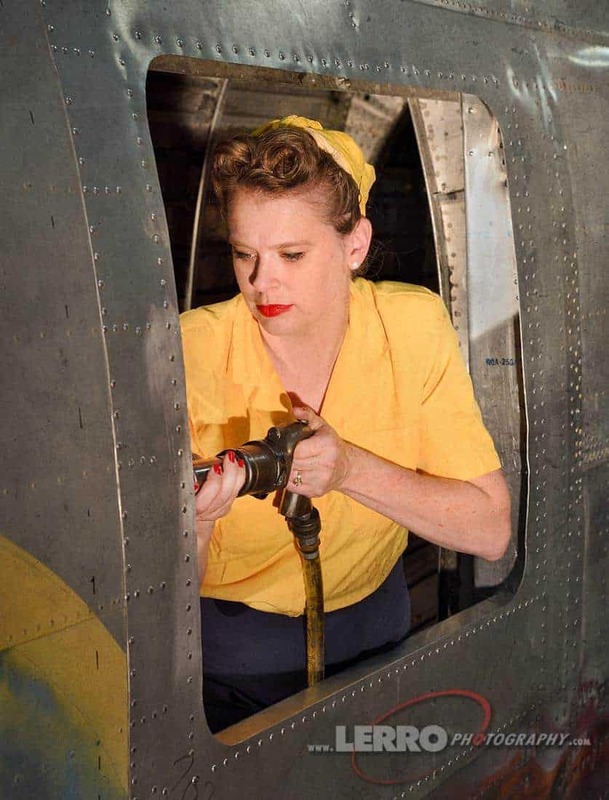 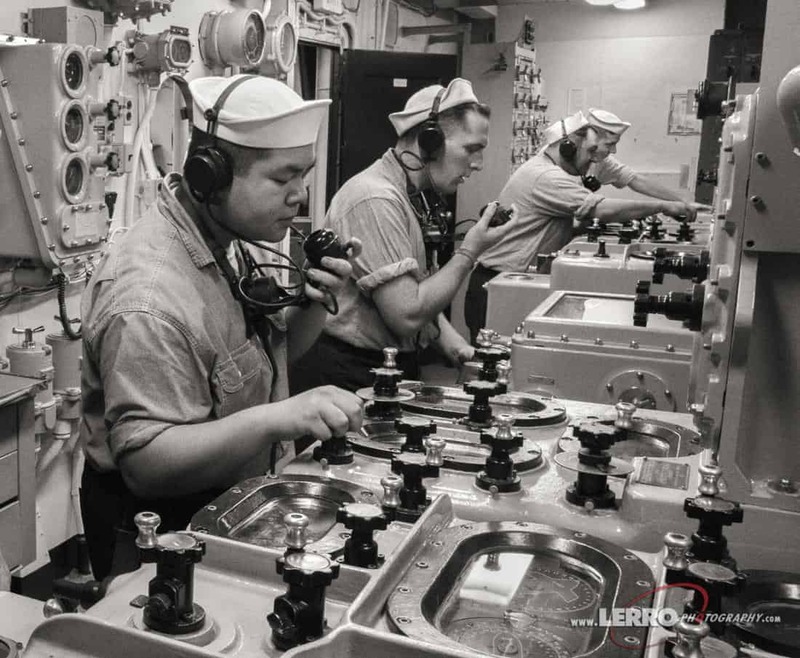 Our ladies performed numerous tasks which included working on a live steam locomotive or plane; utilizing drill presses, rivet guns, welding, and the always popular classy pinup scenes. 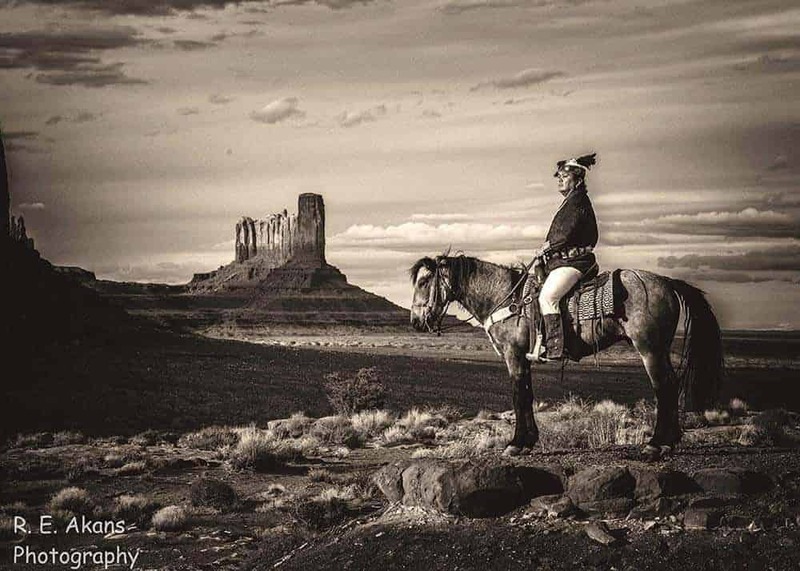 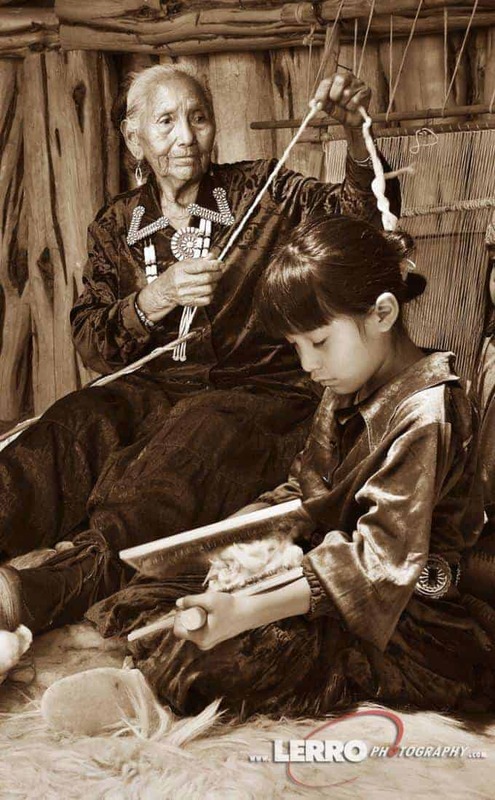 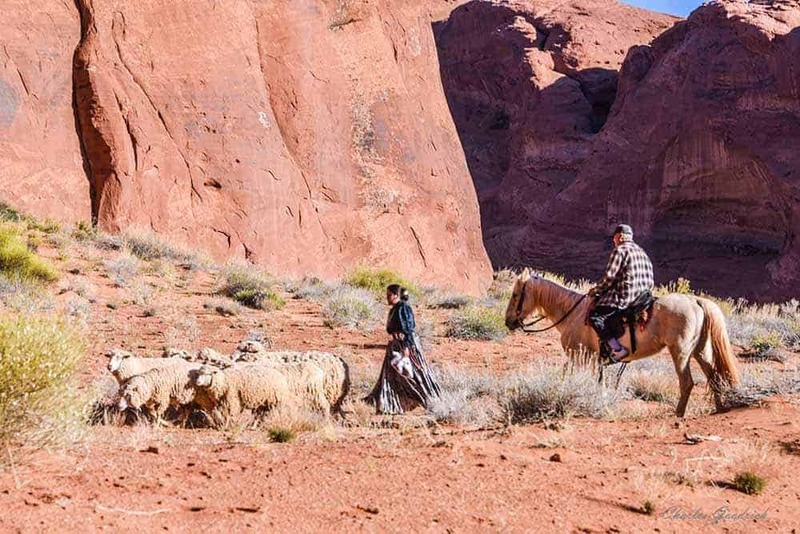 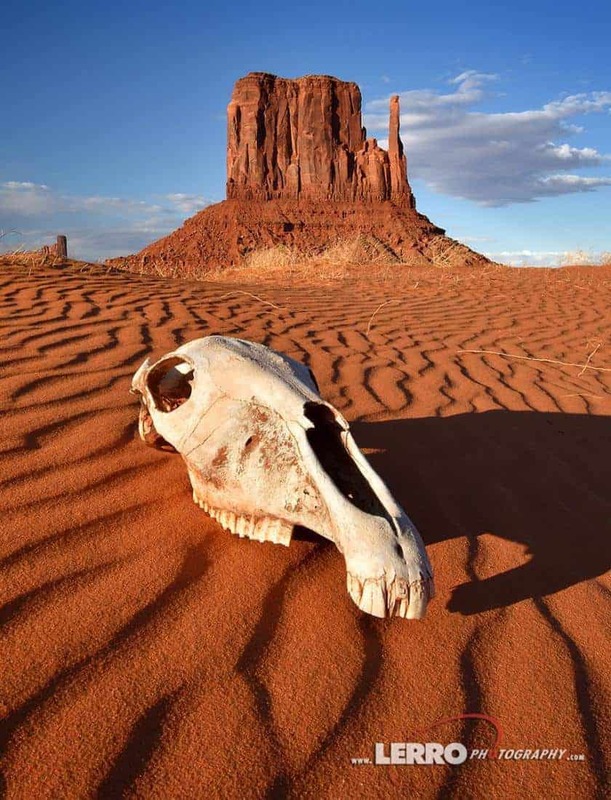 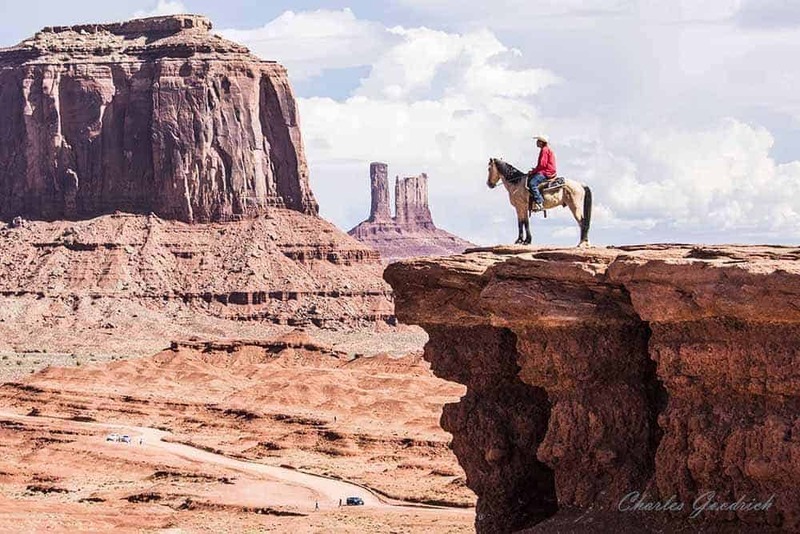 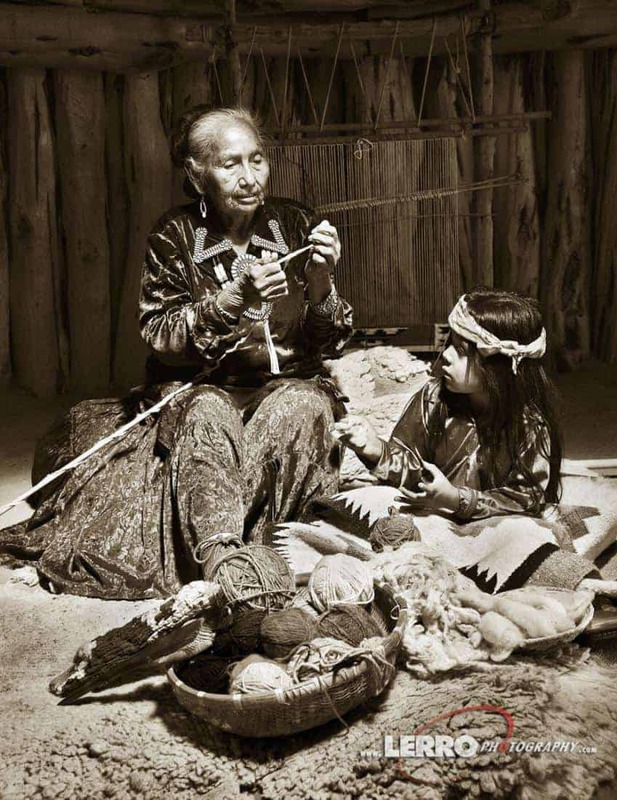 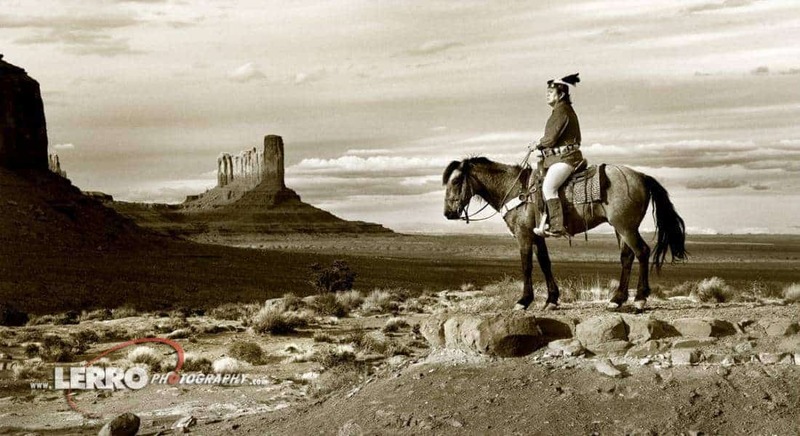 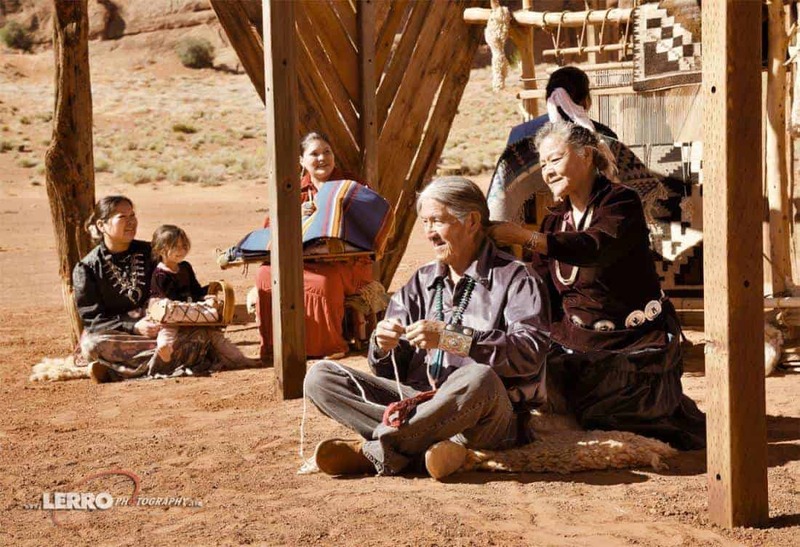 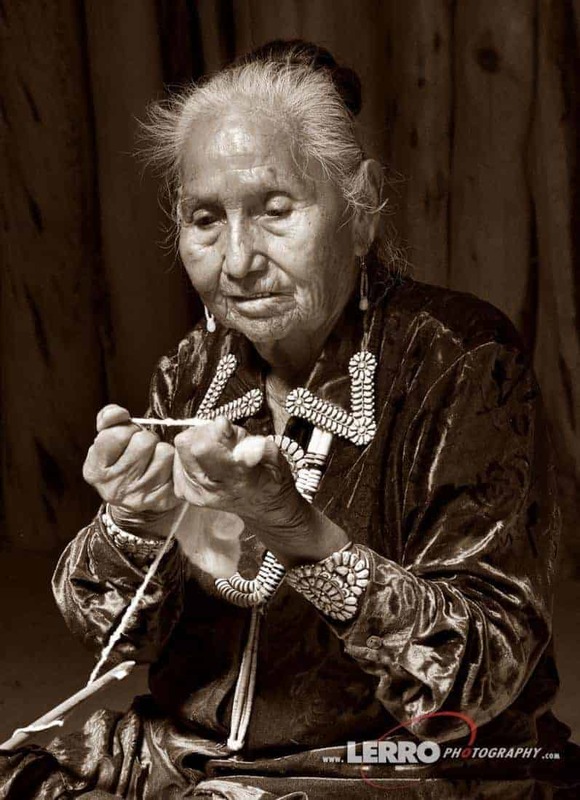 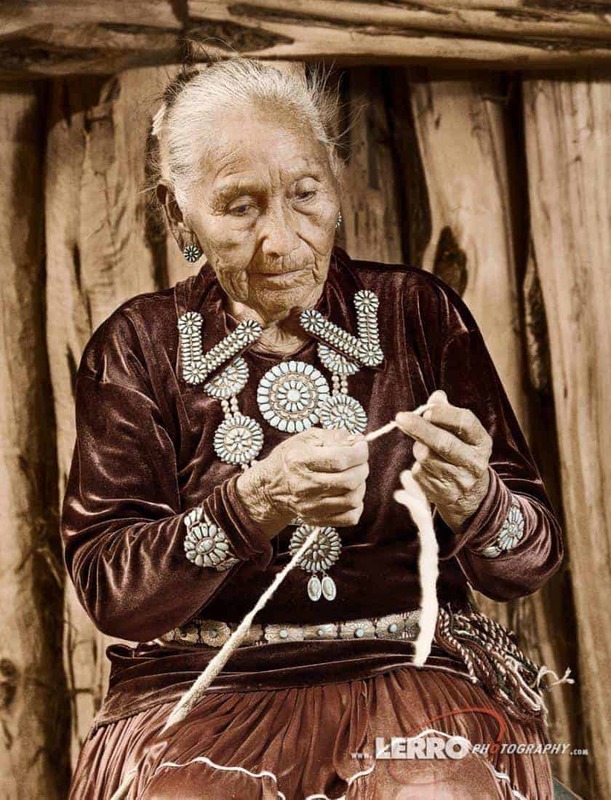 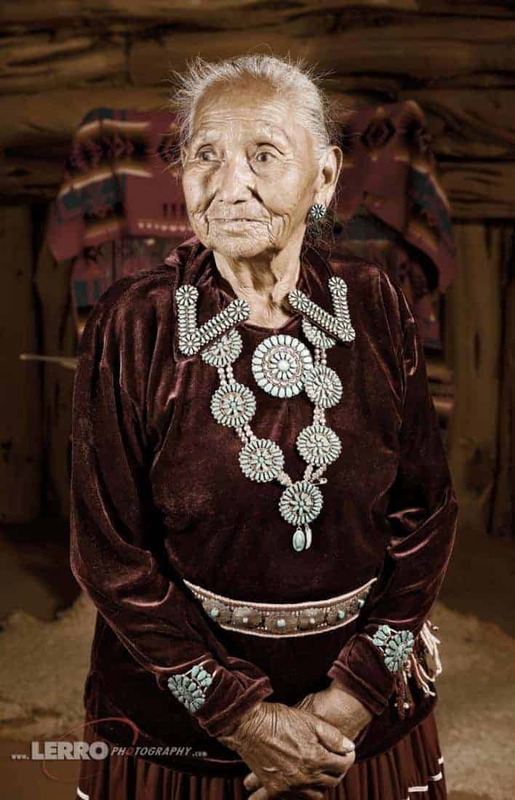 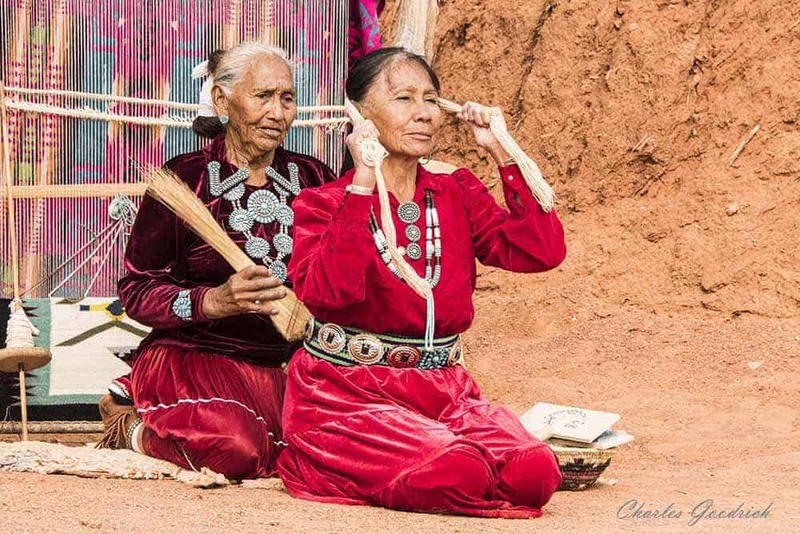 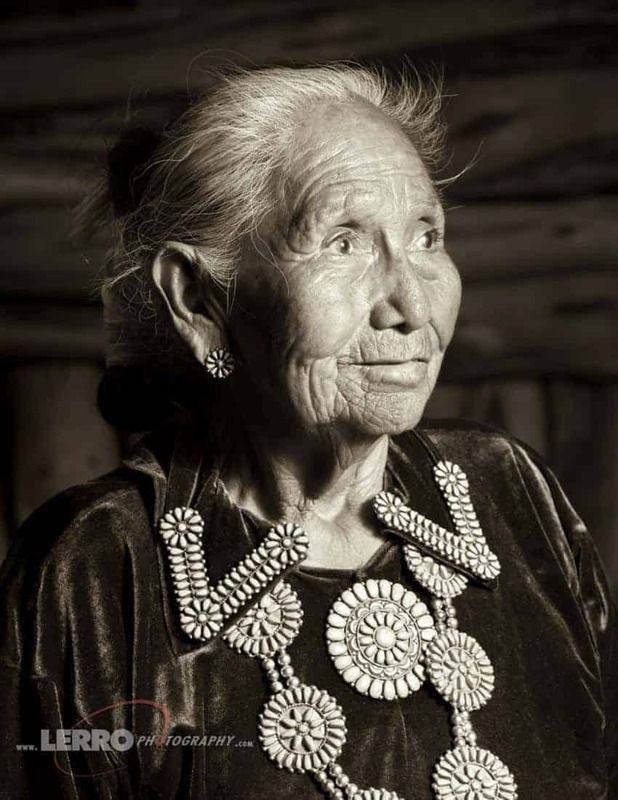 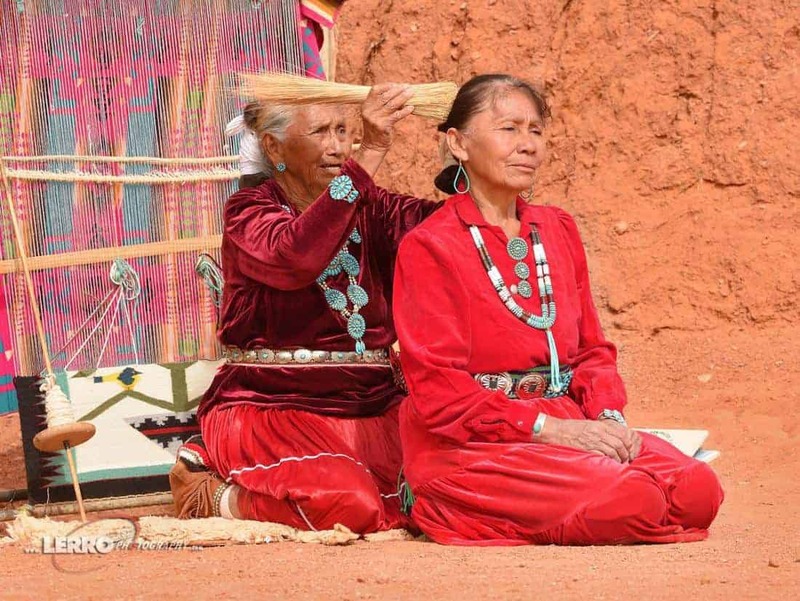 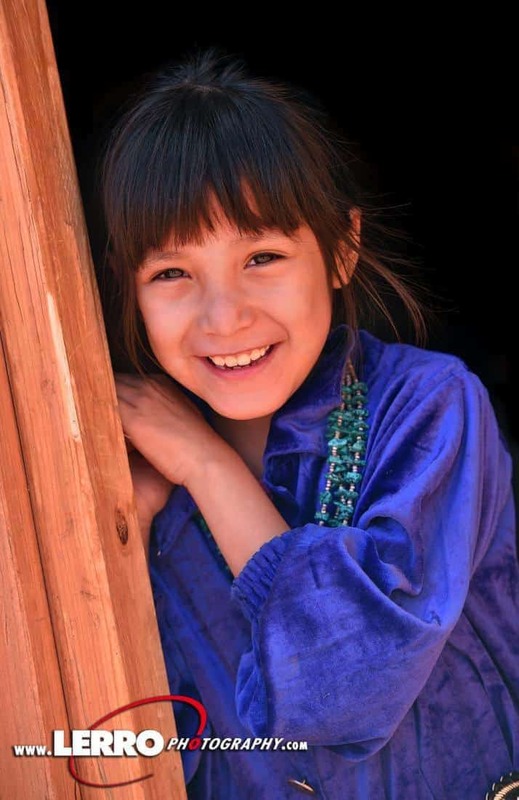 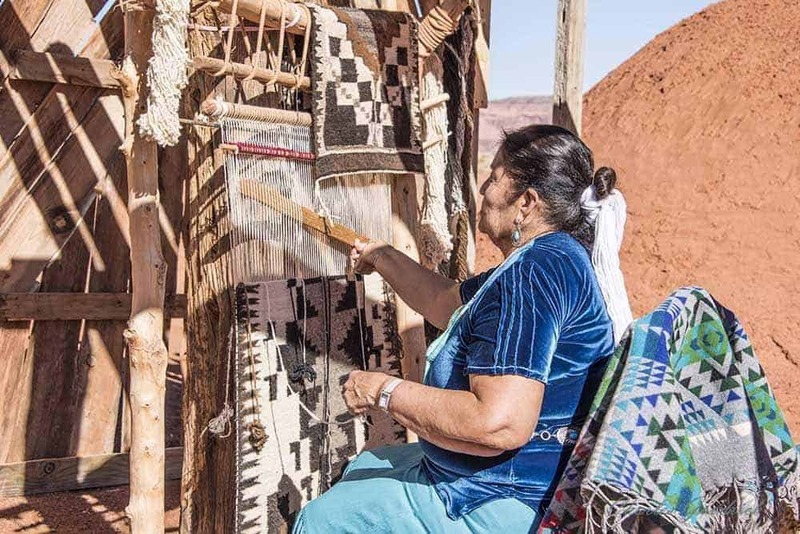 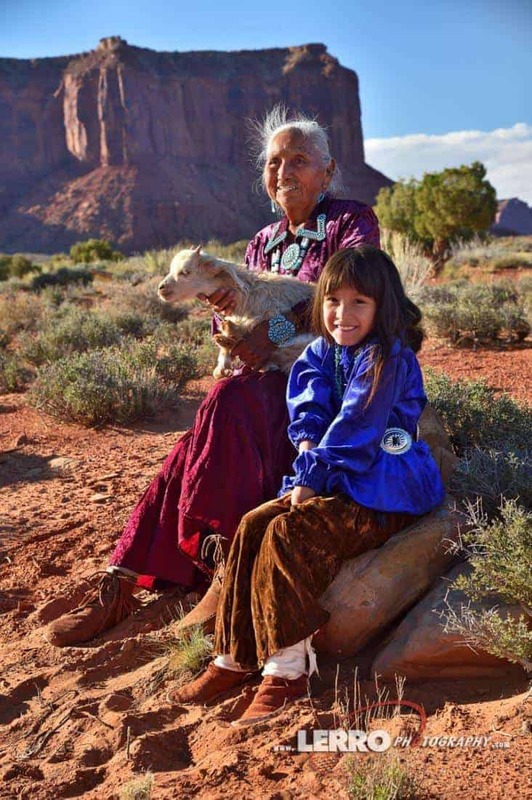 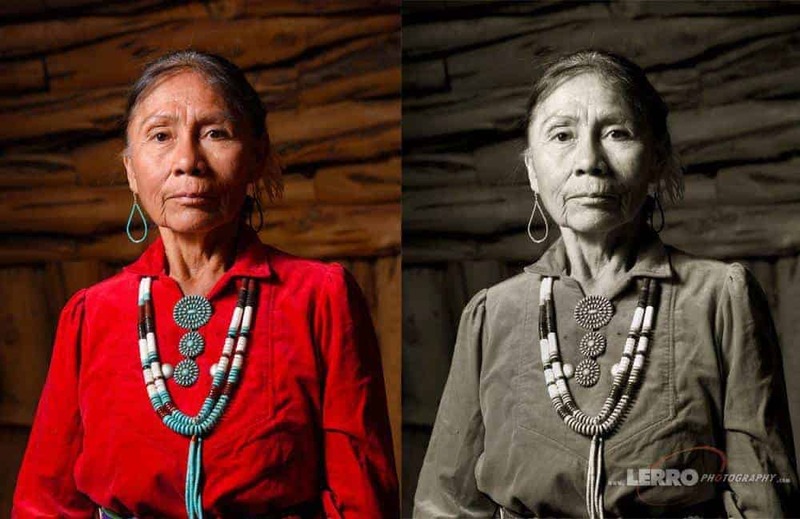 The Navajo Nation – We traveled into the back country of Monument Valley and photographed several families dressed in historic clothing and performed chores such as rug weaving, hair weaving and other tasks that would have been carried out during the 1800s. 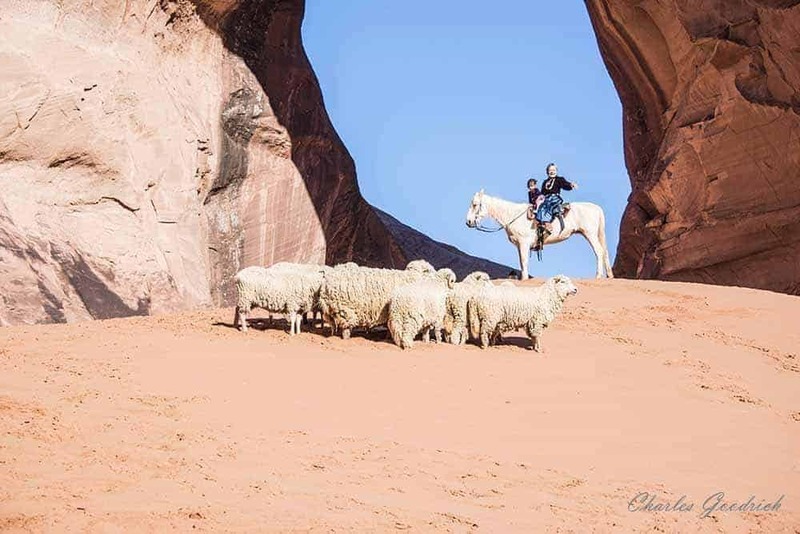 The sprawling desert scenes couldn’t of been a better backdrop for our shoot. 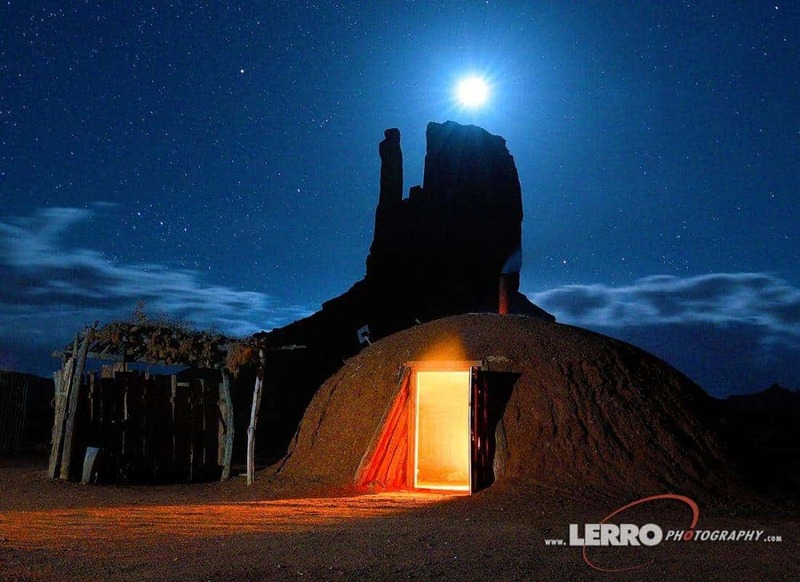 In addition we completed portraits and night shots of the desert with the Milky Way stretching through the sky. 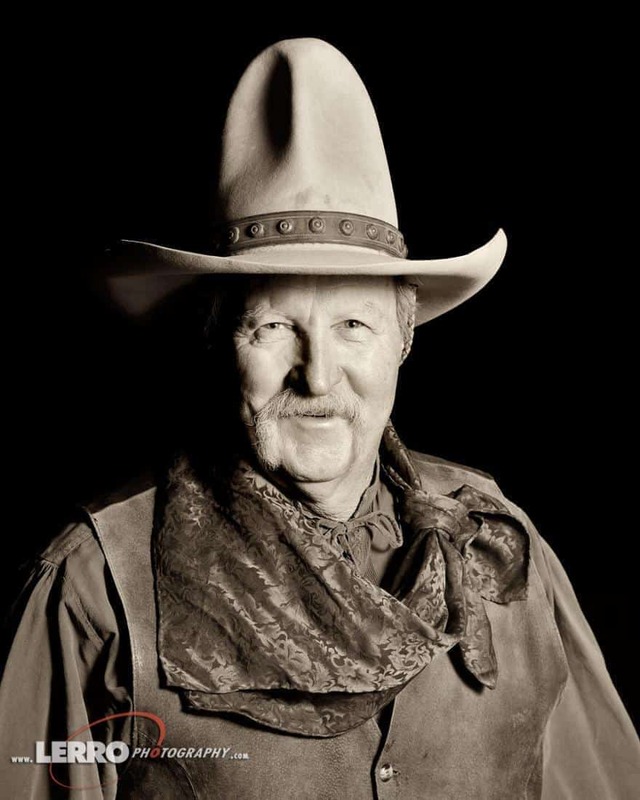 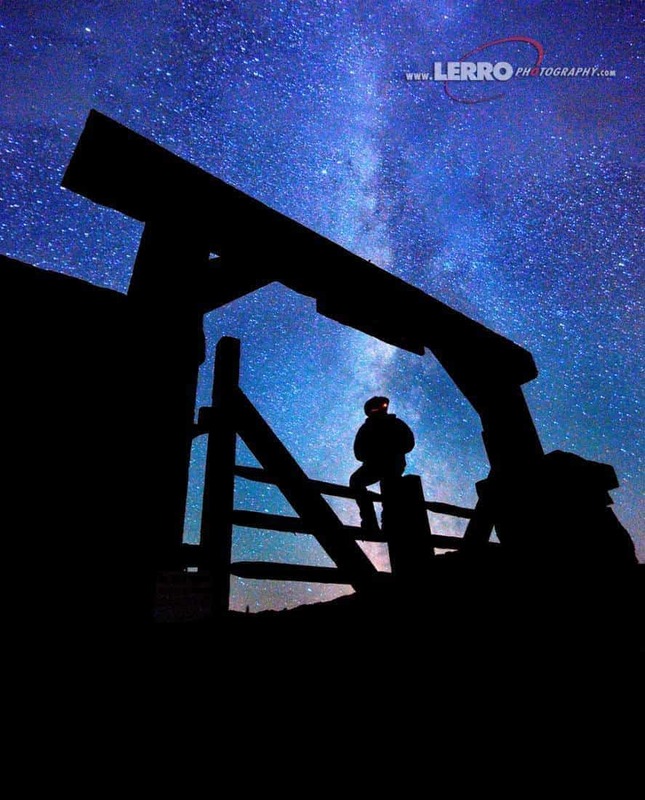 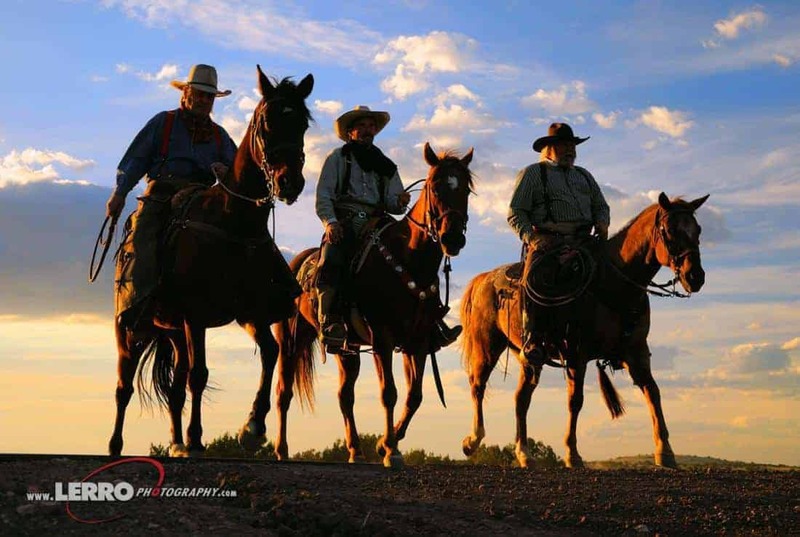 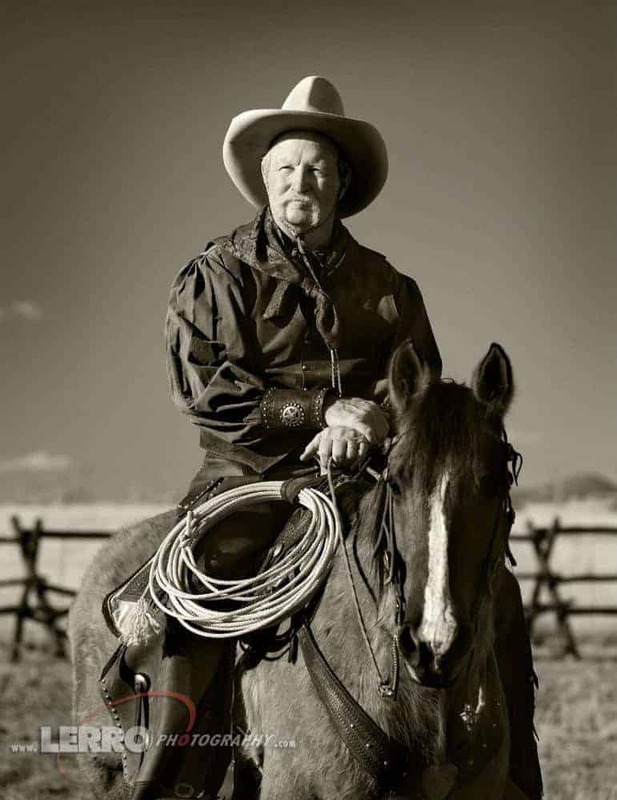 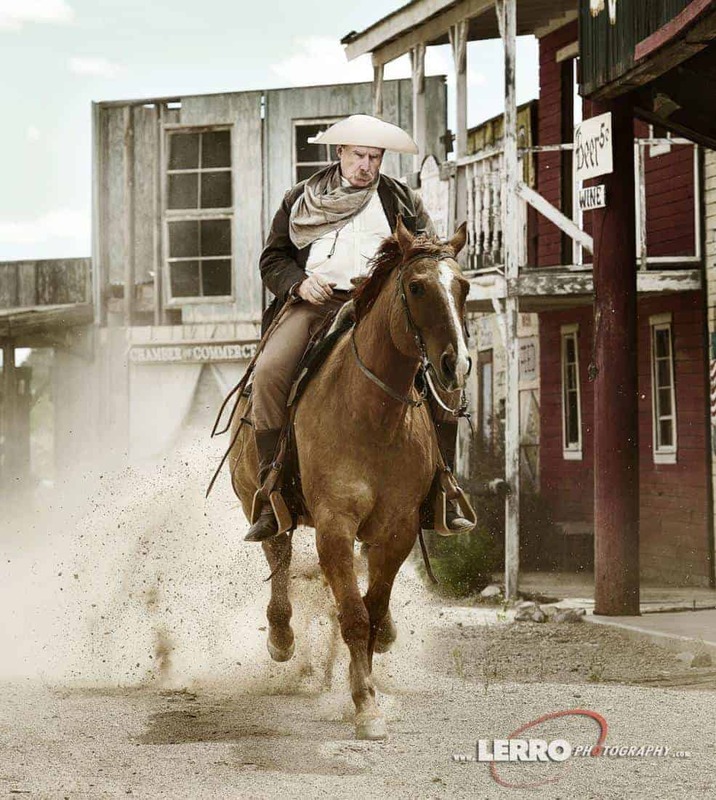 Cowboys of the Southwest – We’ve done several cowboy shoots throughout the Southwest United States. 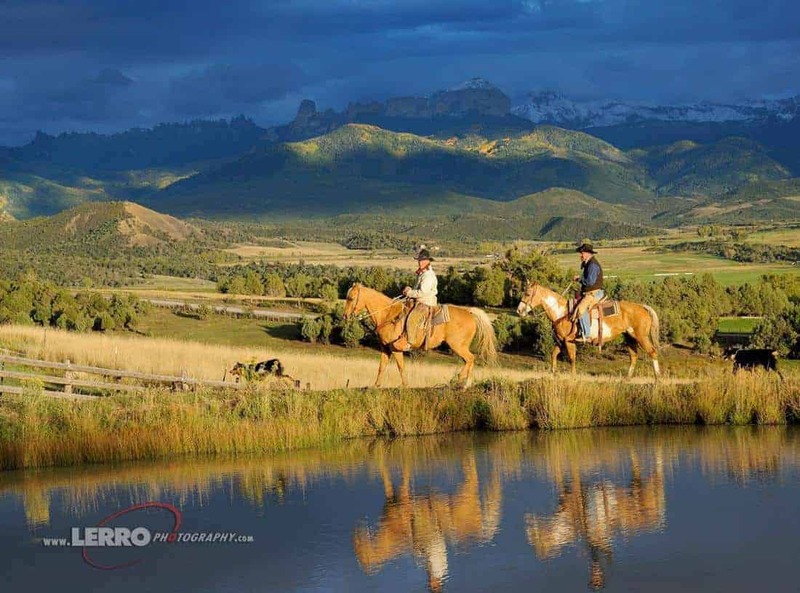 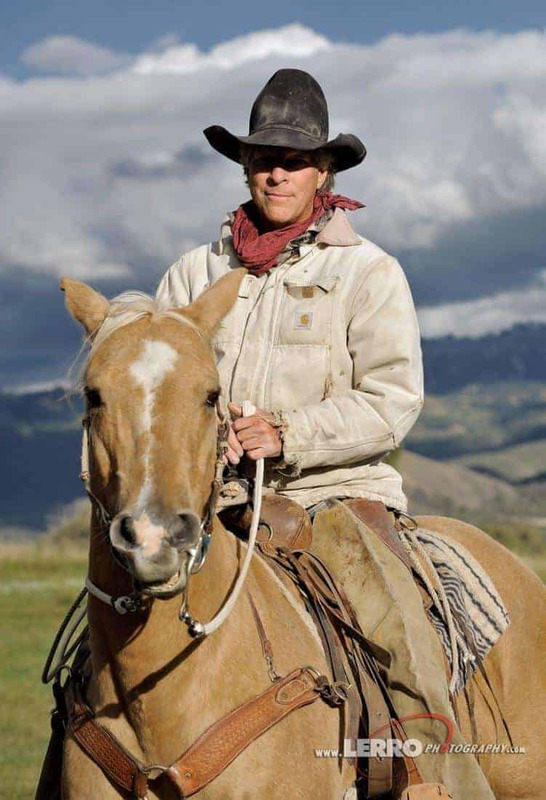 One of our shoots was when fall color was in full swing and the storm clouds were clearing as real cowboys and cowgirls of the San Juan Mountains put on a great show for the photographers. 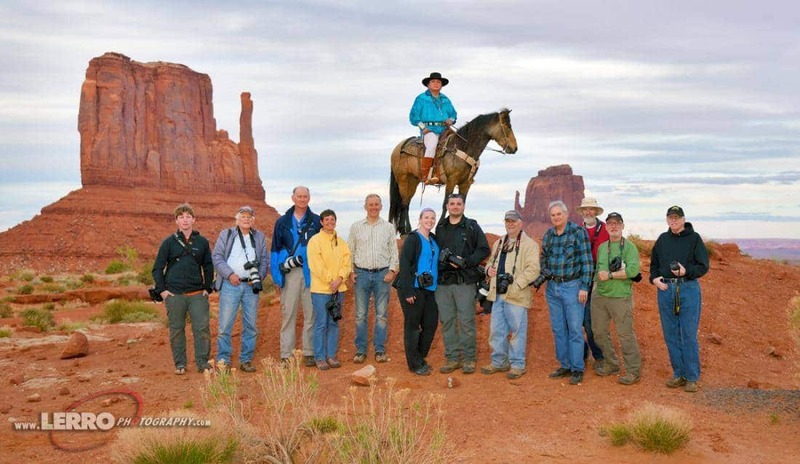 They rustled up cattle and posed with their horses for great portrait opportunities. 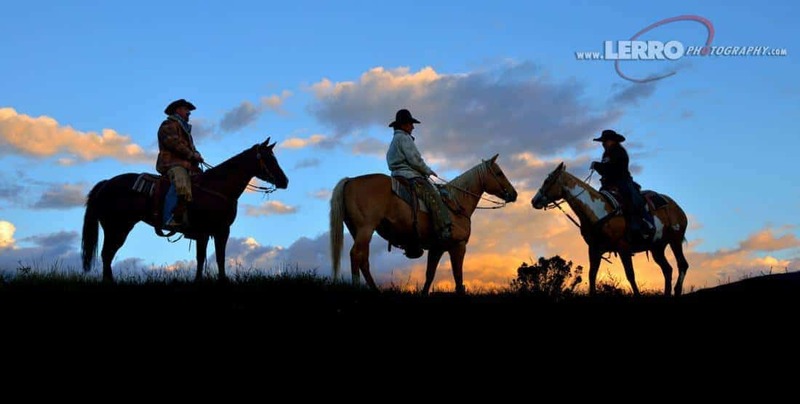 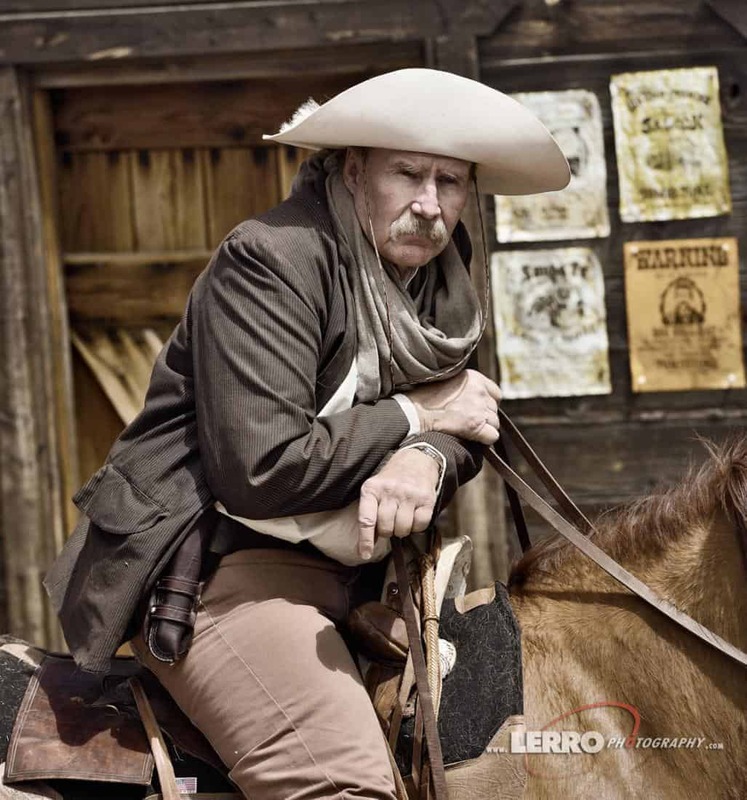 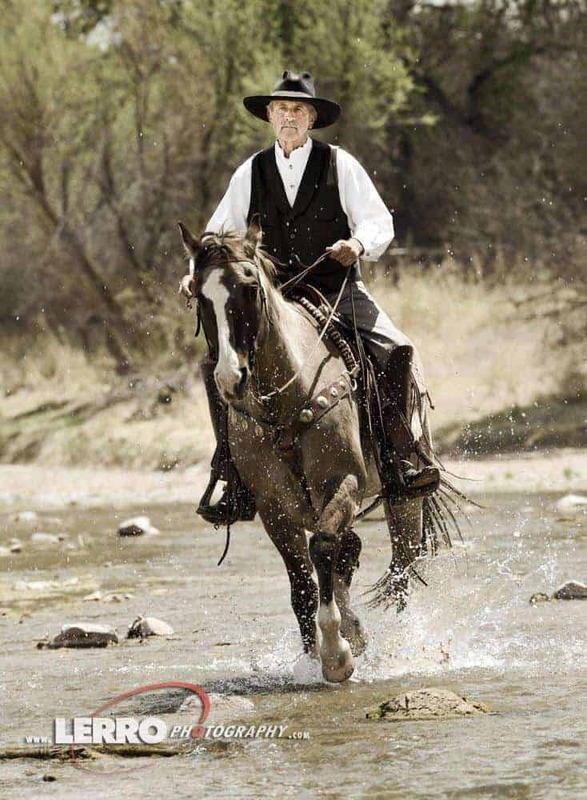 Our other cowboy shoots have taken place in southern Arizona where our reenactors ran through a river, kicked up dust in a ghost town and ran into the sunset on a real working ranch. 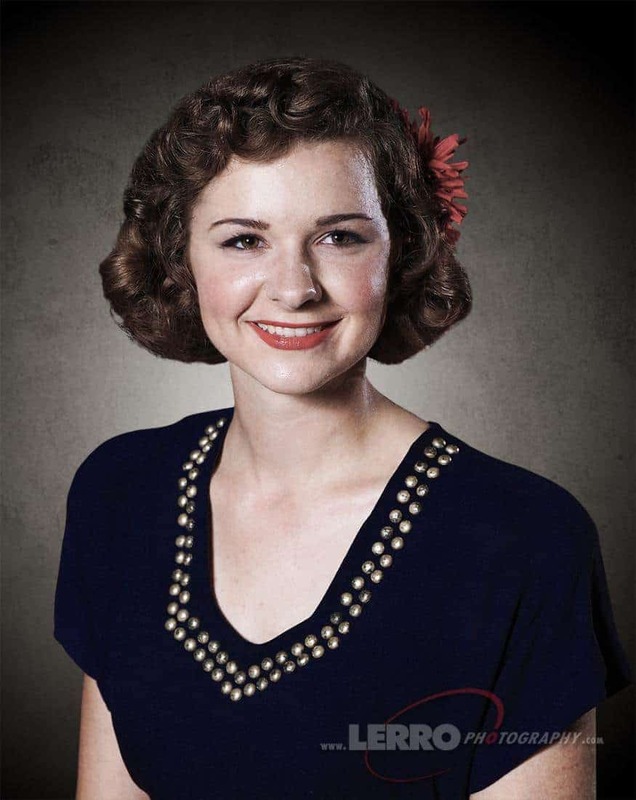 Individual portrait sessions were also done during these shoots. 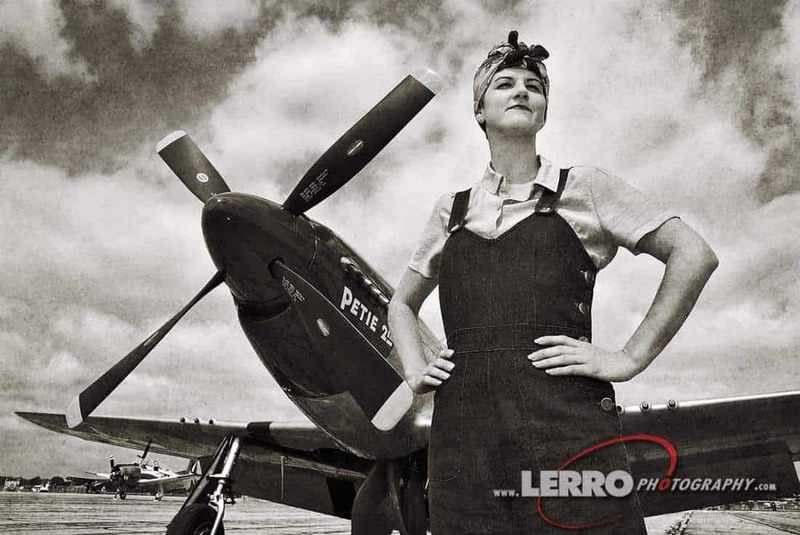 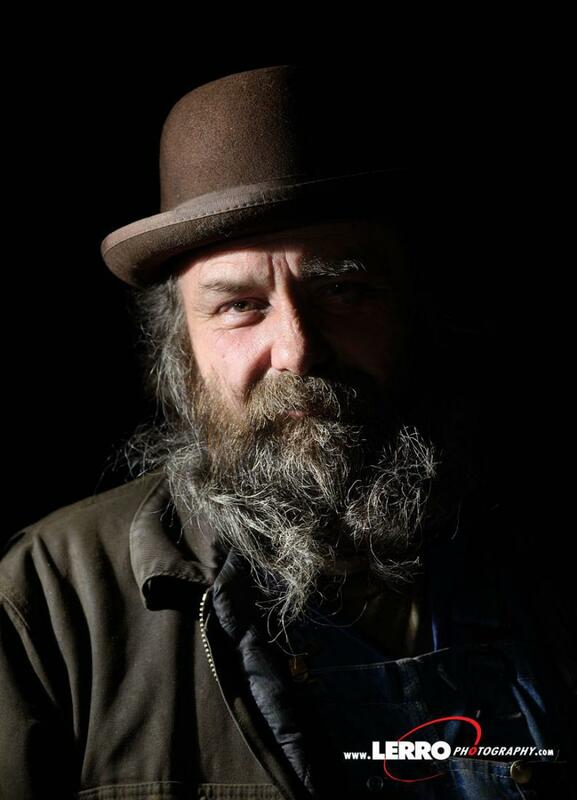 Folks, if you love photography, do yourself a favor and sign up for one of Pete’s photo charters!